It’s time to think pink- the 2017 edition of the Pink Lokai has arrived! 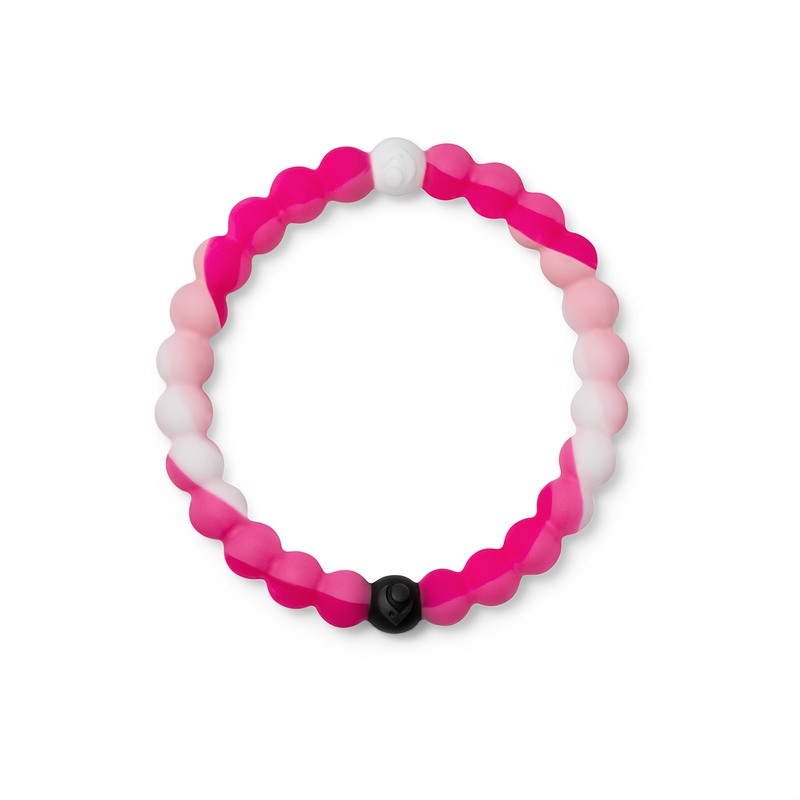 With the purchase of each Pink Lokai bracelet, $1 is donated to the Breast Cancer Research Fund. We love this year’s edition- it has a beautiful mix of opaque pinks in a camo-like print. The pink Lokai are always fast sellers. Make sure to stop by Versant to pick yours up before they are gone! You can also send us a message or give us a call if you would like us to hold one for you. The Alex and Ani Fall 2017 collection has arrived! 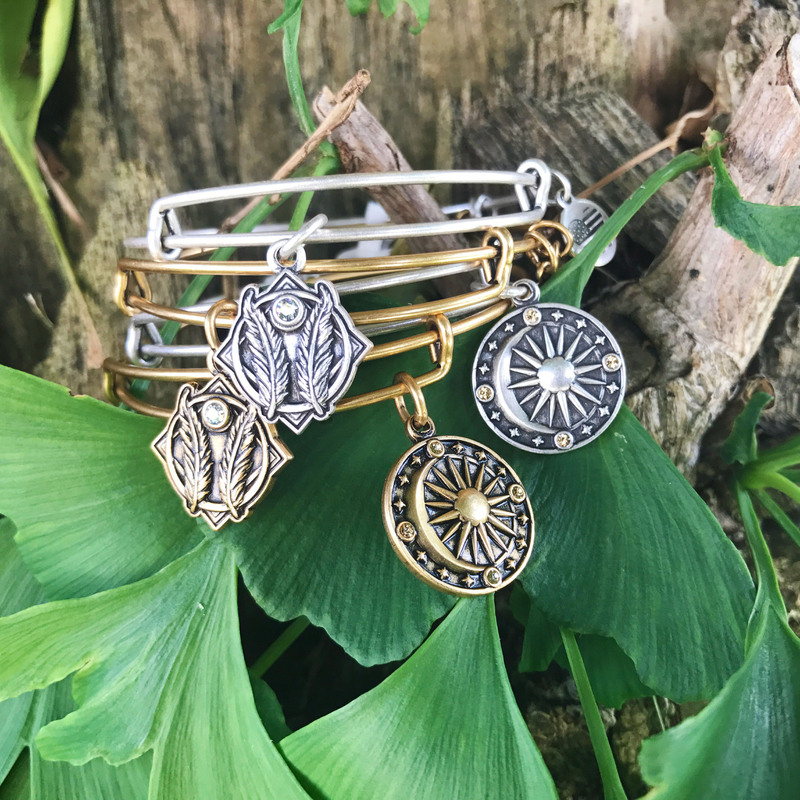 These new additions include some new Path of Symbols bangles, Limited Edition Sets, and beautiful beaded pieces. In addition to the bracelet selections, some fun new necklaces have arrived as well. Check out our review of the new pieces below and make sure to stop by Versant to see these beauties in person! Alex and Ani’s focus this season is Creating Your Universe. This season is about finding a gift, a power that you didn’t know you had. 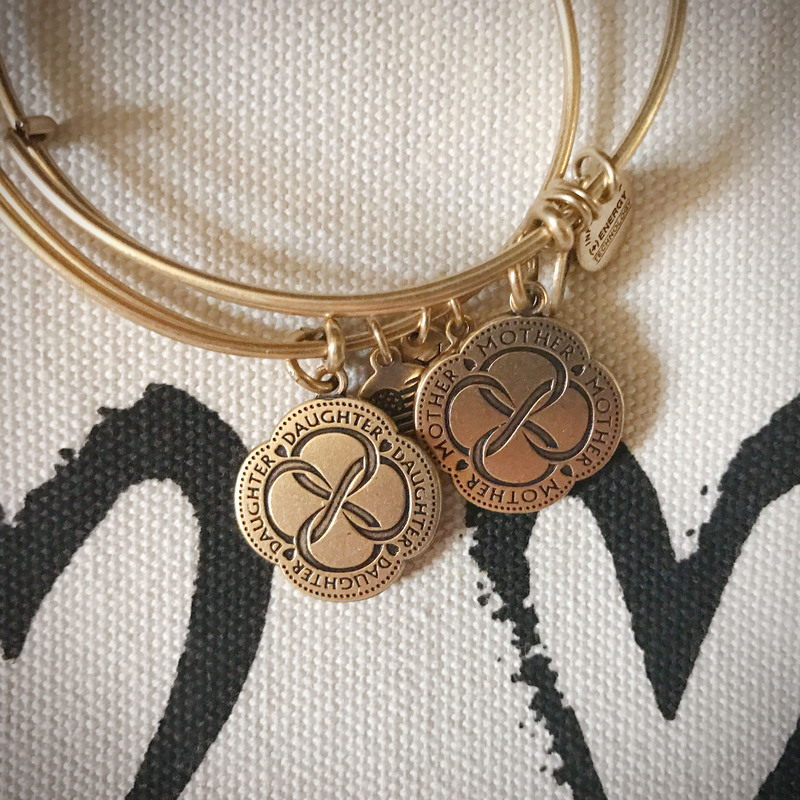 The newest additions to their token bangles include symbols of strength, vitality, and protection. Each of the new symbols comes in a two-tone design. We love that Alex and Ani are mixing both metal finishes in the tokens- it helps unify our gold and silver collections! The three newly added symbols include the horn, arrowhead, and spirited skull. 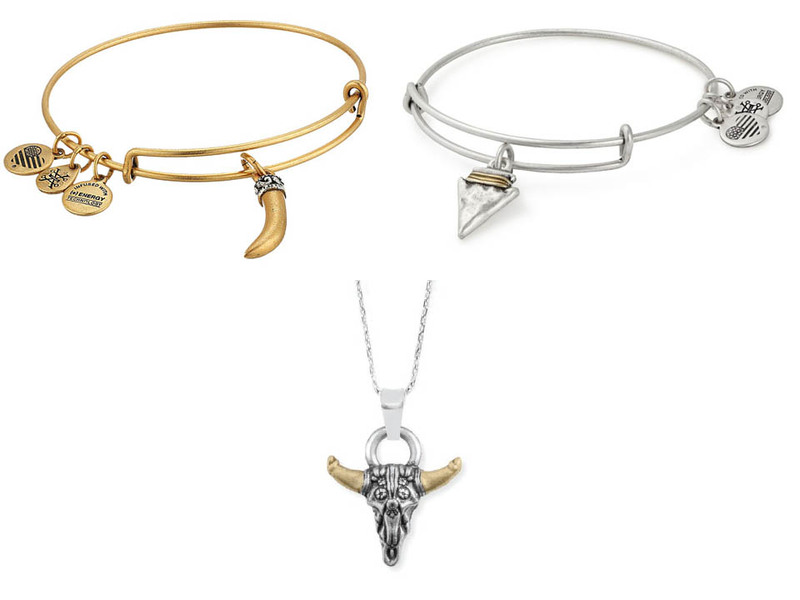 Inspired by the Italian and Greek lucky cornicello, the horn is a symbol of plenty and holds the vital force of life. A symbol of warrior energy, the arrowhead protects you on your journey through life. The spirited skull symbolizes our foundation and history and the strength that these things hold. Also included in the new fall release is a color infusion version of the Calavera. 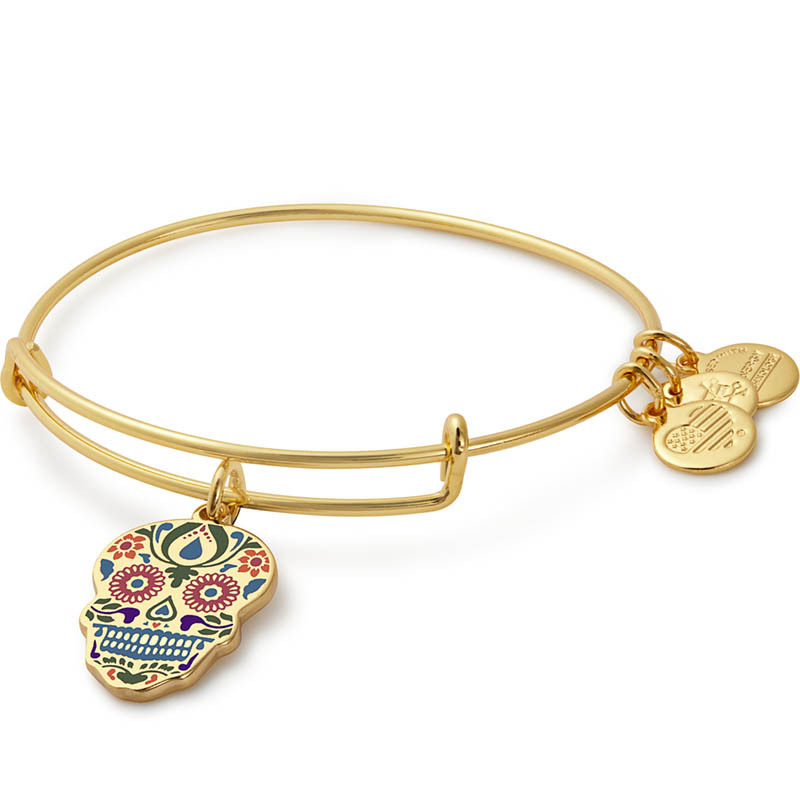 Available in a shiny gold or shiny silver finish, this bangle is adorned with colorful details like a real sugar skull! In addition to the bangles, four new cuff designs have been added. 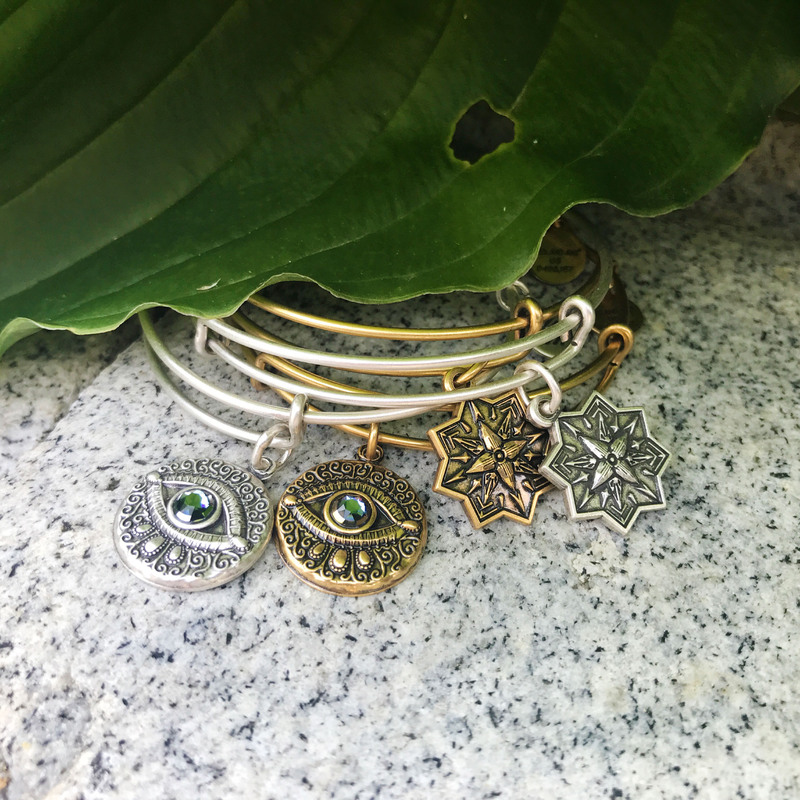 The new evil eye joins the scarab, hand of fatima, and calavera in the cuff collection. All of the new cuffs are available in both Rafaelian gold and silver finishes and are adorned with sparkling crystals. Continuing with the whimsical spring and fall limited edition sets released, fall brings us three new bracelet sets. Each set includes one art infusion bangle in a shiny metal finish with enamel detailing. This bangle is accompanied by coordinating metal and beaded bangles. The Owl set of three is available in a shiny silver finish and is detailed with warm neutrals. We love the forest and moon details on the owl’s chest! The rabbit set of three is available in the shiny gold finish and is detailed with a dark blue-grey. 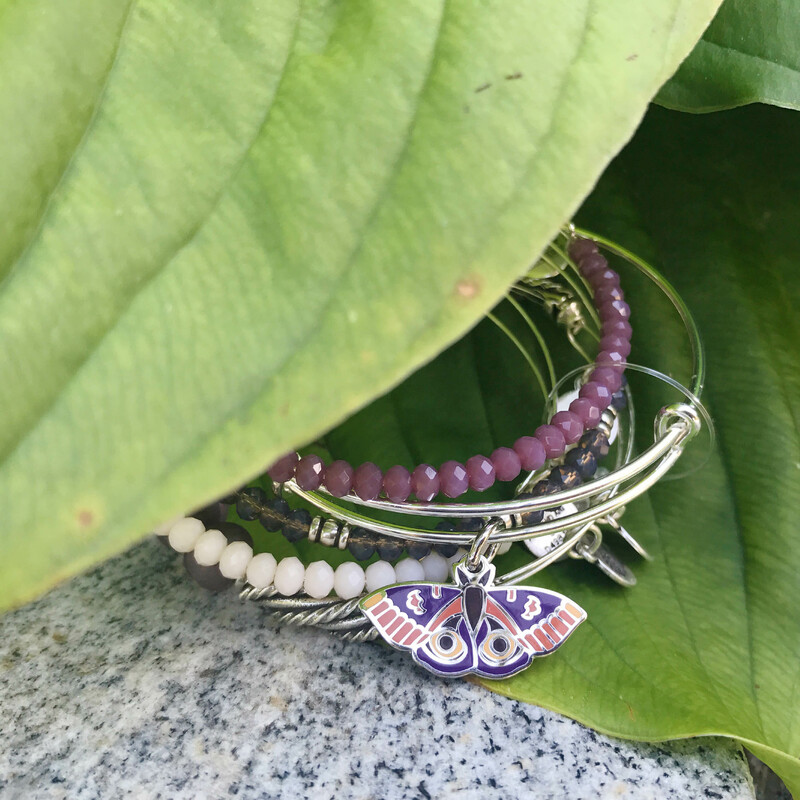 The moth set of five is one of our favorite Alex and Ani sets so far because of the beautiful fall color palette. Adorned with colors of plum, marigold, and persimmon, this set is available in the shiny silver finish. In keeping with the sets, the beaded additions this season cover a range of rich fall hues. Most of the beaded wraps are opaque with a pearlescent finish, making them very unique compared to previous selections. The colorful beaded pieces are a wrap design, making them great for fitting closely to any wrist size. 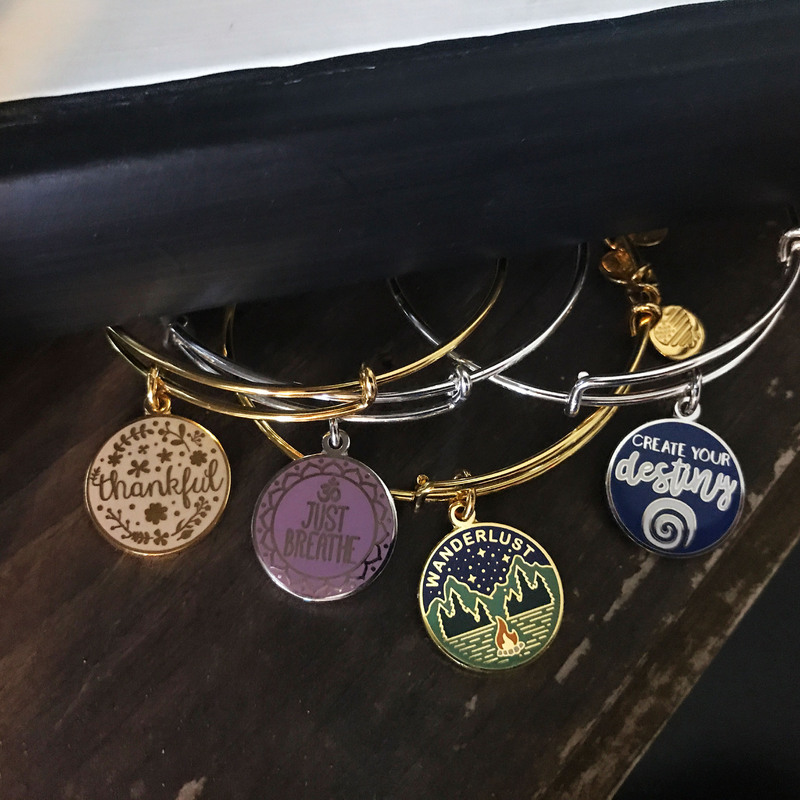 In addition to the new color palette selections, some metal beaded bracelets and wraps are also included in the Alex and Ani fall collection. These pieces add great texture to your charmed arm. 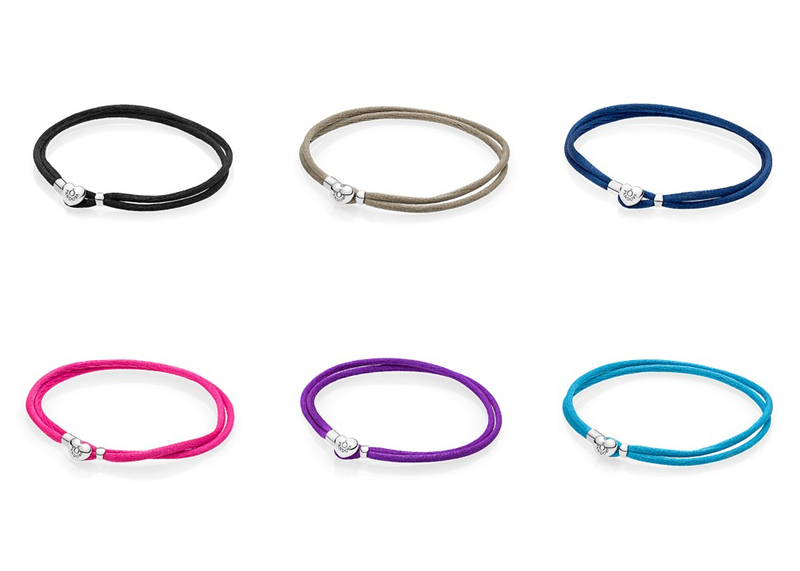 We love the new two-tone offerings to tie in our new two-tone bangles! A fan favorite, the leather wrap, has been reintroduced in a braided design. Available in espresso with Rafaelian gold or nightfall with Rafaelian silver, these wraps make a bold statement. We love them for ourselves and for the gentlemen in our lives as well! The Alex and Ani fall collection also includes new symbol-studded metal wraps. These wraps are available in both Rafaelian silver and gold for the Path of Life and Hand of Fatima designs. We love these and are hoping for more symbols in the future! The newest tokens are available not only as bracelets, but as necklaces as well. 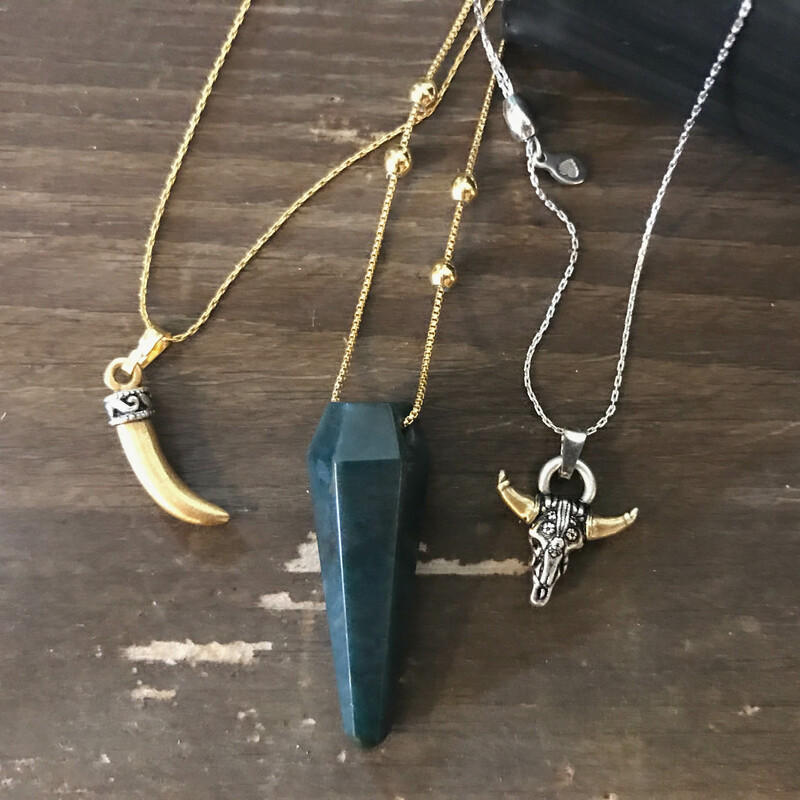 The Spirited Skull, Horn, and Arrowhead join the Evil Eye and Cosmic Love as expandable pull-chain necklaces. The spirited skull is available in both the Rafaelian silver and gold chains. The Earth Sultry collection has also expanded with new Pendulum pendants. Beautiful moss agate, shown above, and obsidian pendulum pendants are available on an expandable chain necklace. These necklaces include chain station beads for adding charms! 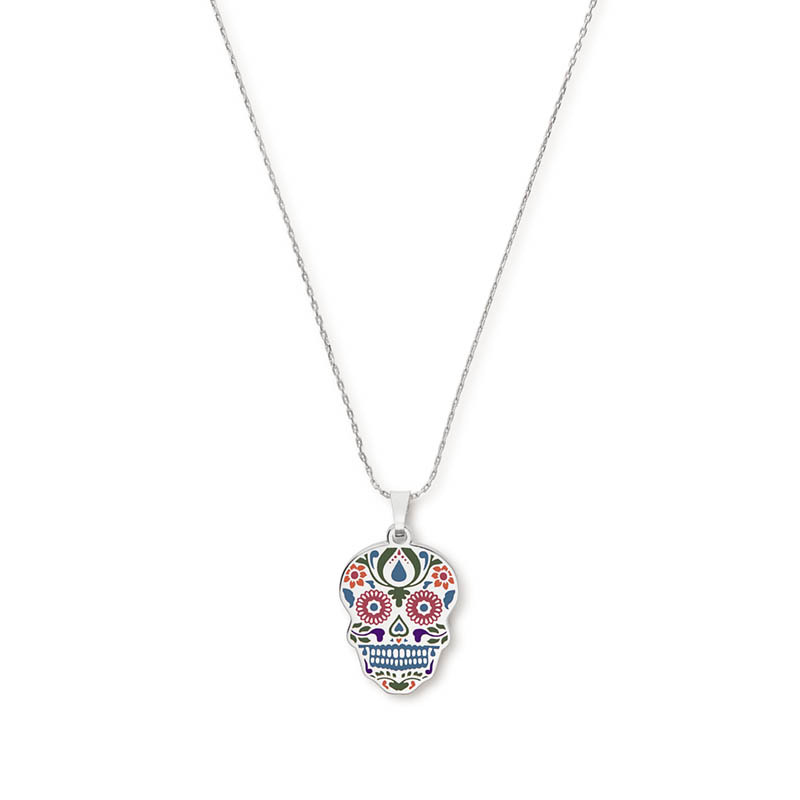 The Color Infusion Calavera also includes a necklace version. This necklace is available in a shiny silver or shiny gold finish. The new Pandora pre-autumn Friends and Fun themed collection has arrived! To celebrate, from July 20th – 30th you will receive a FREE Pandora Girls’ Night Out themed tote bag with your purchase of $125 in Pandora! Treat yourself to some of the sparkling new charms commemorating those fun summer nights out on the town and grab a free tote while you are at it! The pre-Autumn collection, available starting this Thursday, includes some beautiful new friendship and “Girls’ Night Out” charms. 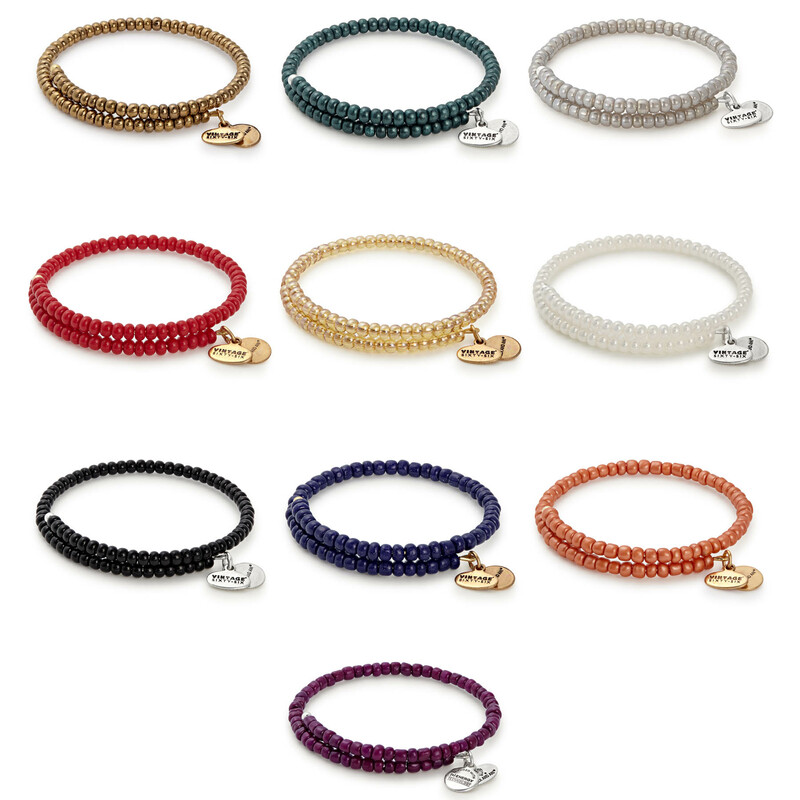 In addition to the new charms, six new colored friendship bracelets, made from nylon cord, are being released as well. At $35 these new bracelets are great for stacking, gifting, and adding a fun pop of color to your wrist. 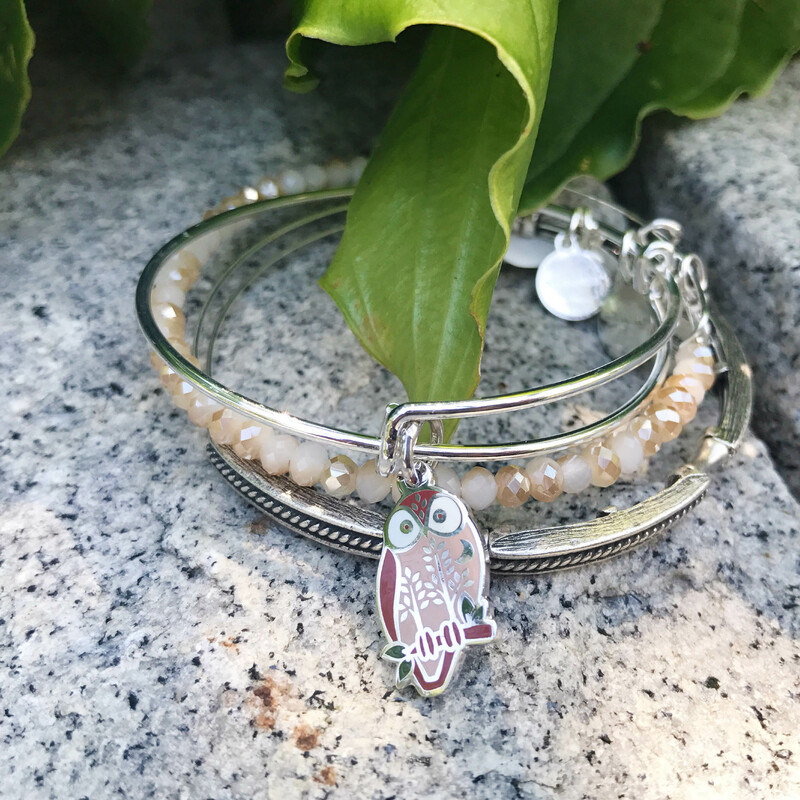 Get two bracelets and the new friendship charm pair to honor your best friend! 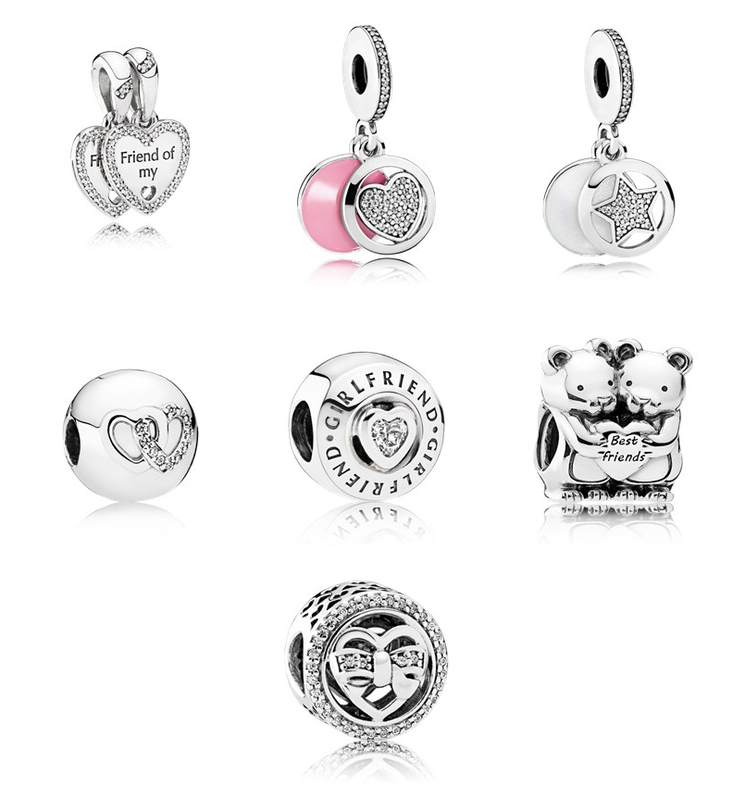 The friendship charms feature bright silver with touches of sparkle or soft colored enamel. Some of our favorite new friendship themed charms include a new set of two emblazoned “Friend of my Heart”, an intertwined hearts clip, and a sweet duo of best friend bears. The Girls’ Night Out themed charms are bright and bold with red and black enamel setting off some significant sparkle. We love the new clutch purse, fruity drink, and champagne bottle charms! Our Pandora stylists are ready to help you navigate through the new collection pieces. We can’t wait to share them with you! 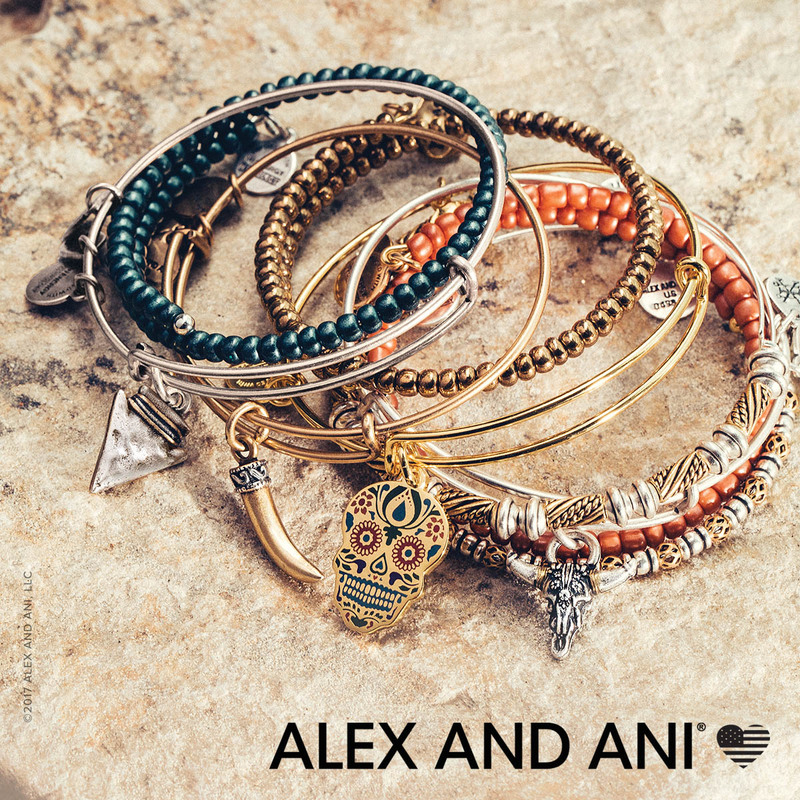 The Alex and Ani Pre-Autumn mini collection has arrived at Versant! Included in this small collection are redesigned versions of some of our favorite retired styles, a new Core style, and four new Words are Powerful Limited Edition seasonal bangles. Some of our favorite core bangles were retired early this year and have, until now, only been available as the new cuffs. With this new collection Healing Love, Godspeed, and Cosmic Balance are invited back into the bangle world! We love both the meanings and the aesthetic of these three designs. In keeping with the newer designs, the redesigned bangles have a more 3-dimensional feel and most of them feature sparkling Swarovski stones. We love the new Cosmic Balance design with the halo of sparkling stars around the sun and moon. The Godspeed is a nice balance of the geometric and the natural and makes a great addition to any charmed arm. 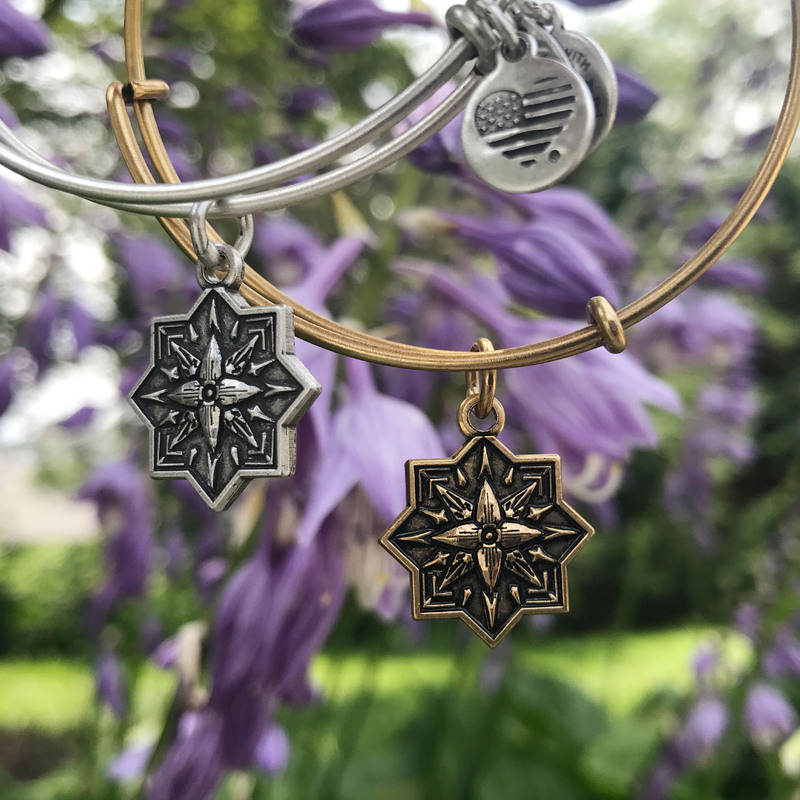 The redesigned Healing Love has the shape of an 8-pointed star and is the only new bangle style that does not include a crystal. In addition to the three redesigned styles, a new symbol has been added! The Evil Eye, a symbol of protection across cultures, is set against an ornate background and has a bright blue gaze. In addition to the new core styles, four new seasonal Words are Powerful styles are included in this collection. We love the Thankful (a great bangle to grab now and keep as a Thanksgiving gift!). The Just Breathe is a fun gift for the Yoga girl. Both the Wanderlust and the Create your Destiny are great gifts for the new grad setting out on their next adventure! 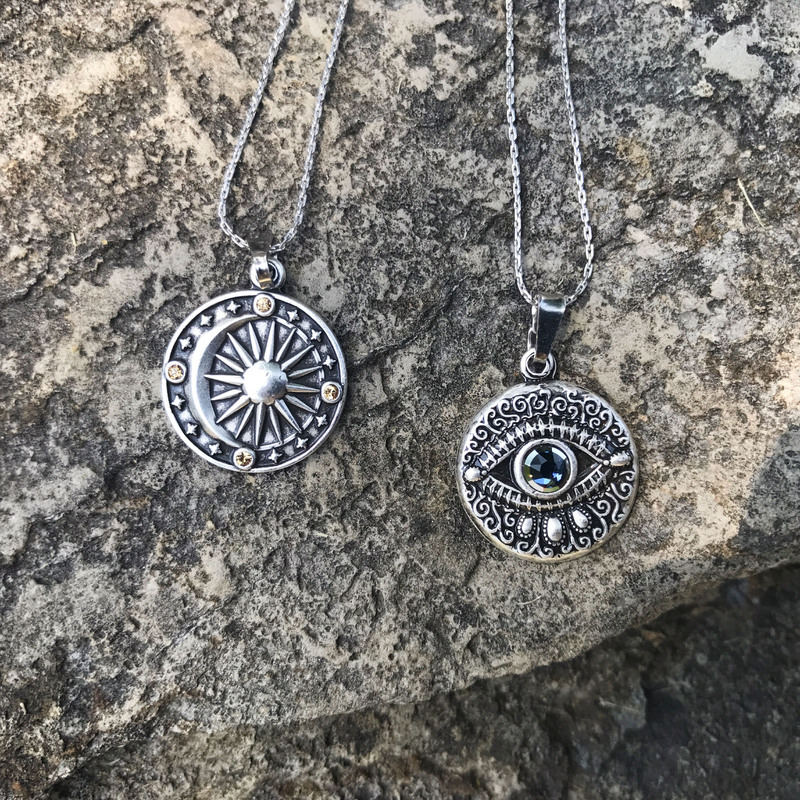 In addition to the new bangles, two new Rafaelian silver expandable necklaces have arrived in the Cosmic Balance and Evil Eye designs. The necklaces include two moveable beads that allow for the addition of two more chain station charms. Interested in the new Alex and Ani pieces? It is always better to see them in person to get a true idea of their size and detail! Bright colors, sparkling stones, and dreams of the beach- that’s what summer is about! 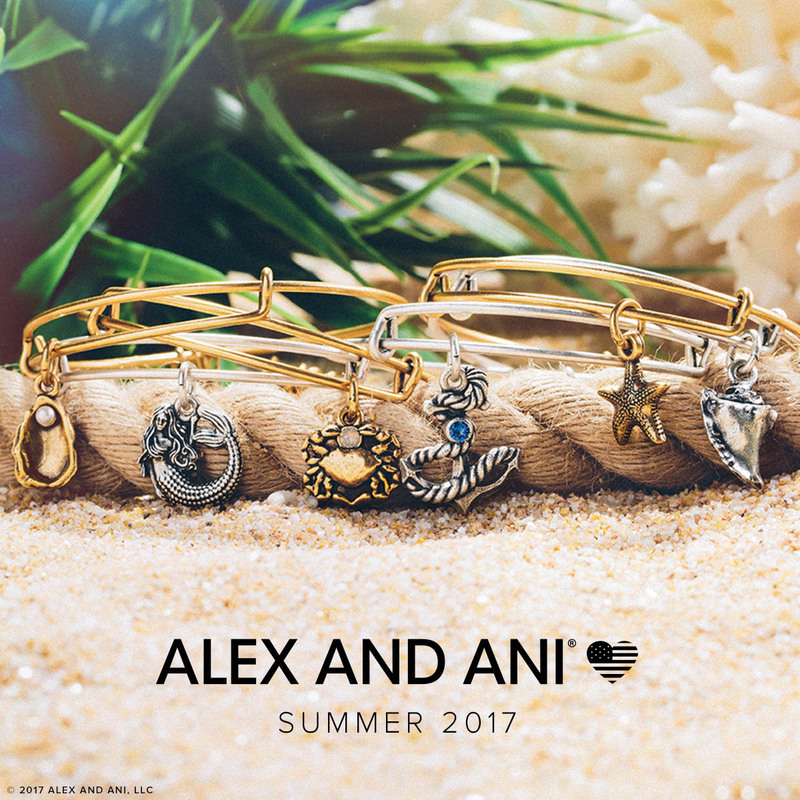 The Alex and Ani summer collection, Serendipity, catches the essence of summer. 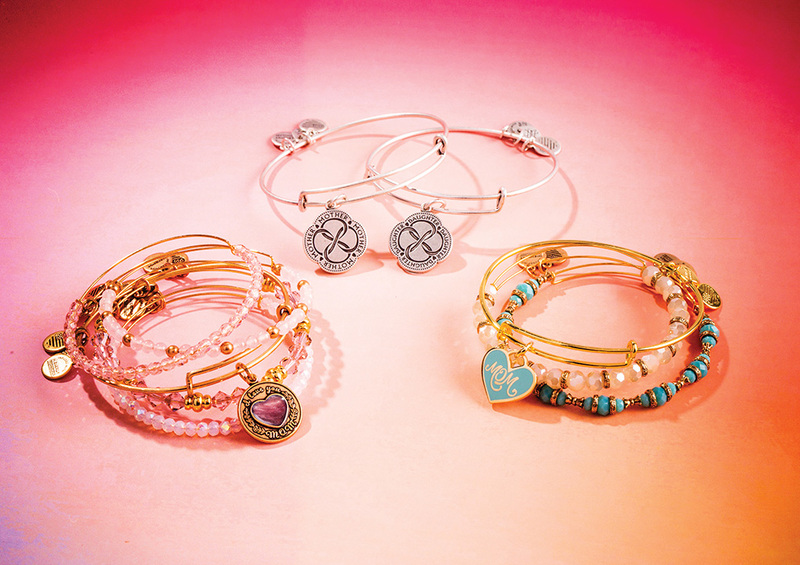 With new bangles, beaded bracelets, and Limited Edition sets, there is something for every charmed arm! Grab your sunnies and check out our review of the new additions below. The seaside bangle collections has received a long overdue update with the summer collection! These bangles are some of the oldest styles still available. Now with the redesigned symbols, you can continue to collect anew! We love the new design of the starfish and the mermaid- they are much more detailed than the original designs. The new charms are slightly smaller than the old charms, making them great for layering, and some are adorned with Swarovski crystals for added sparkle! The Words are Powerful collection has also received an update. A lot of the original bangles have been redesigned with colorful enamel. There are some great new additions as well! 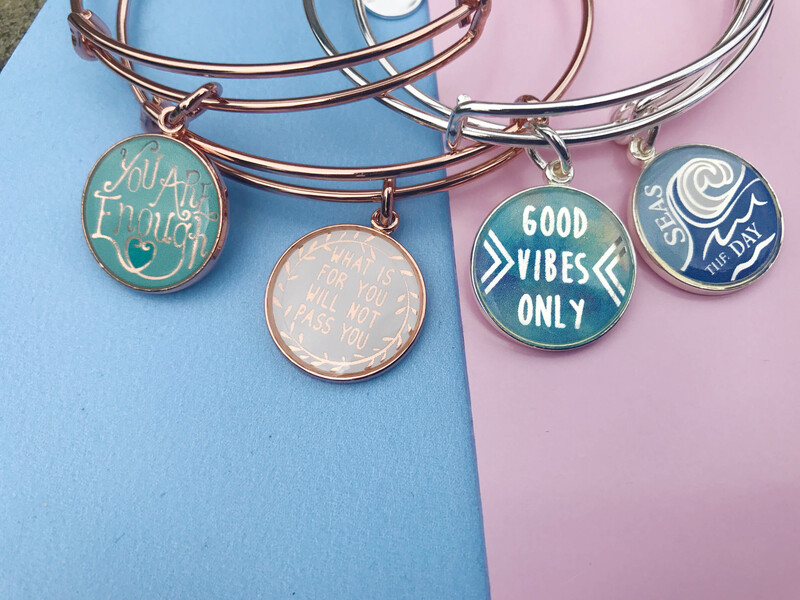 The Seas the Day and Good Vibes Only bangles sum up our summer mantra! We also love the new What is For You Will Not Pass You in the shiny rose finish. 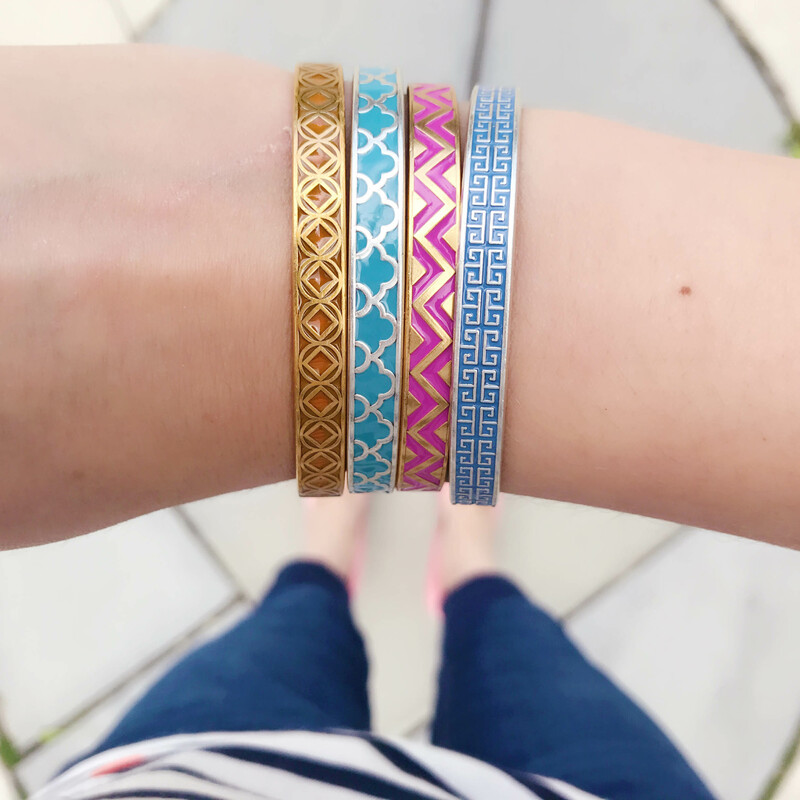 Some of these new bangles will be Limited Edition for the summer collection only- get them before they are gone! The shiny gold finish bangles make a great addition to any summer charmed arm as well. We love the new Everything Happens for a Reason in bright white with the warm gold. 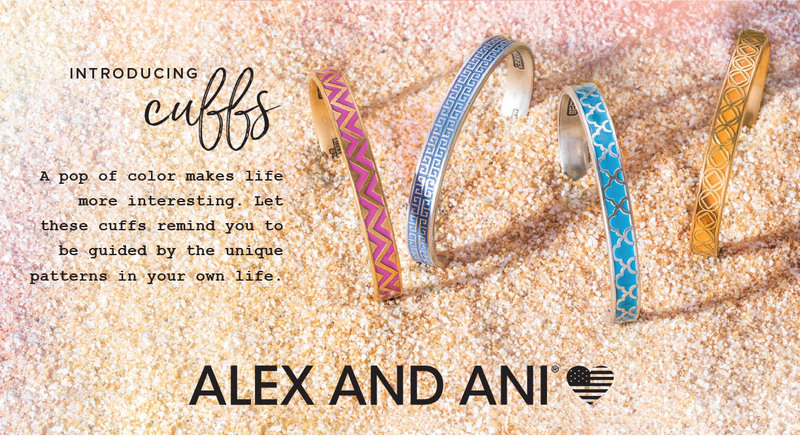 Summer is the season of color, and Alex and Ani has embraced this with their new super-saturated beaded bangles. With natural elements, such as wood, intermixed with brilliant faceted stones, these bracelets are gorgeous on their own and add a touch of summer to any bangle stack. A lot of the new bracelets are the wrap-style, making them a great choice for any wrist size. We love the mixture of the bright orange and fuchsia- it reminds us of a summer sunset! The ocean-inspired emerald green and cobalt blues mixed with the Rafaelian silver finish are beautiful as well. Looking to add a touch of color but don’t want to go too bright? The bangles with wood beads strike a great balance between color and neutrals. 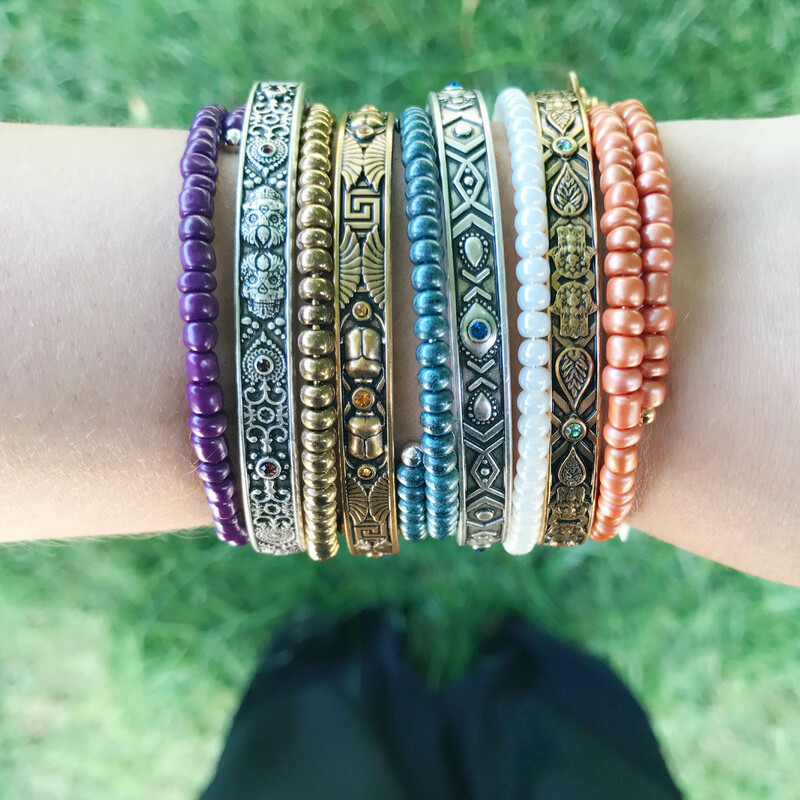 Some of the new beaded wraps offer a more muted summer tone as well- and they are only $28! 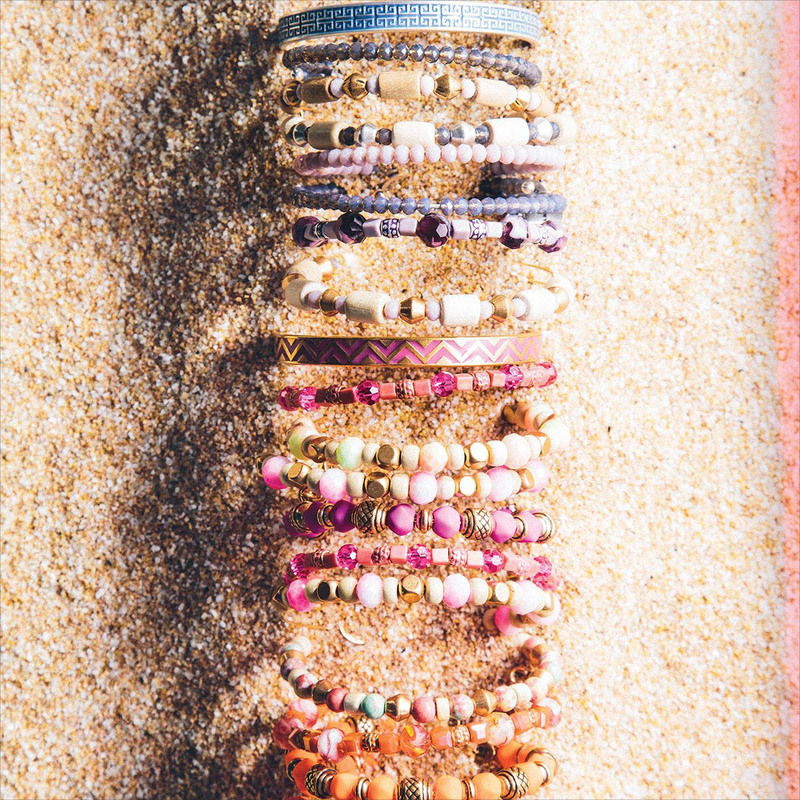 We love the look of stacking different summer beaded bracelets styles together for a beach-ready stack. The beaded bracelets are not the only way to add some color to your charmed arm this summer! 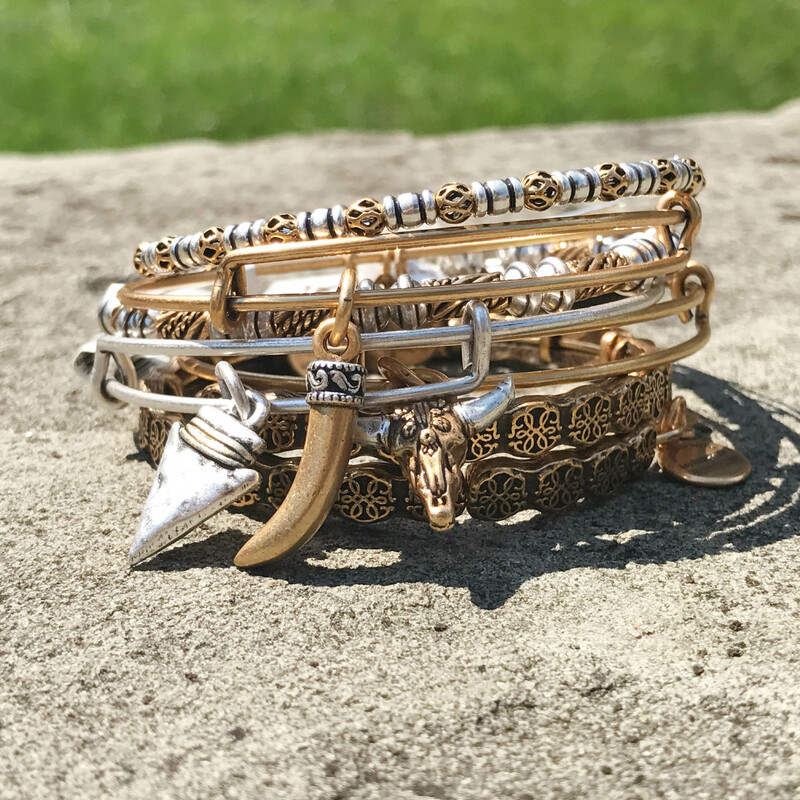 Four new Limited Edition enamel cuffs have been released as part of the Alex and Ani summer collection. 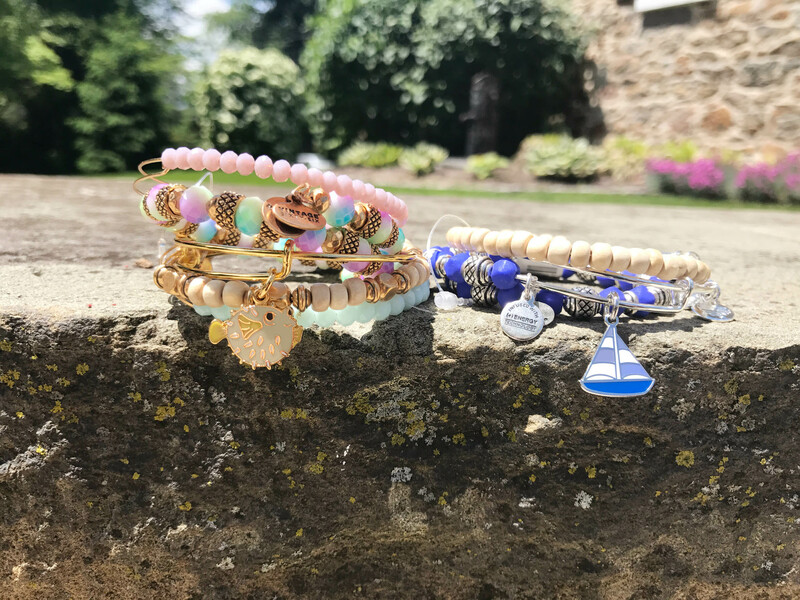 With pops of color embedded in the Rafaelian gold and silver cuffs, these bracelets add some summer fun to the top of your wrist while your charm bangles fall below! Each bangle has a different summer-inspired pattern. We love the look of the blues with greek key and moroccan tile inspired patterns. 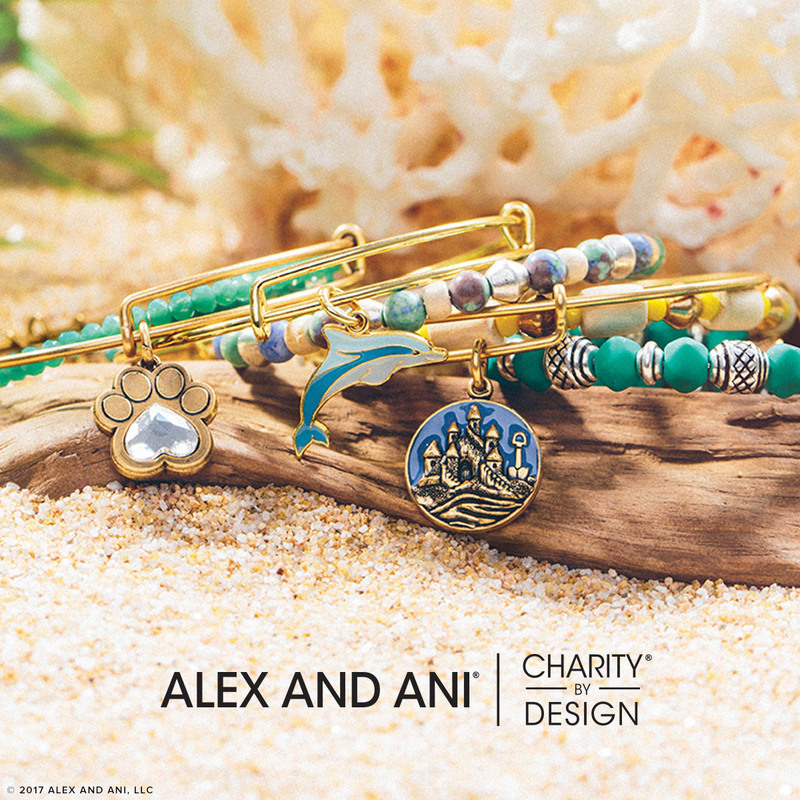 Four new Charity by Design bangles have been released as part of the Alex and Ani summer collection as well. 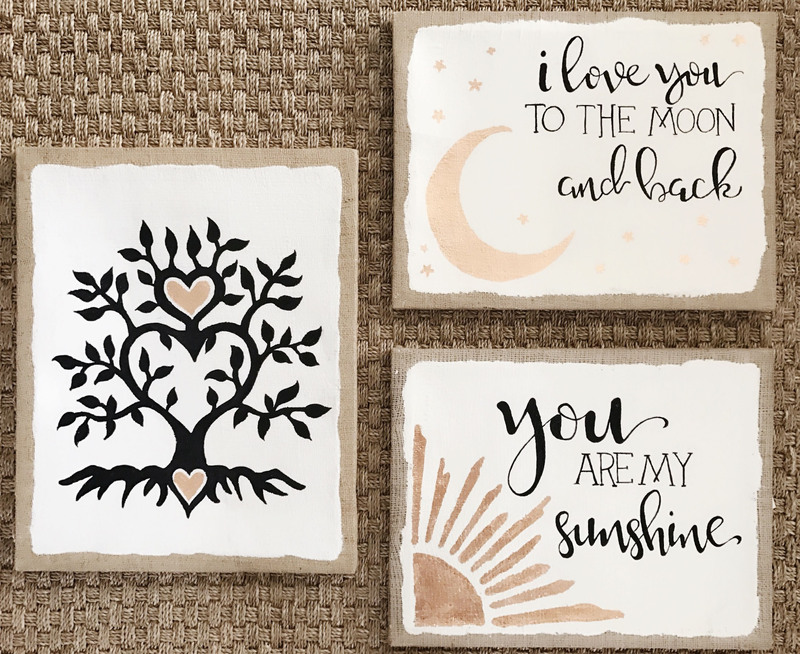 Some are redesigned old favorites (welcome back Prints of Love!) and others are entirely new bangle styles. The new Sand Castle bangle represents a fortress of strength and love. 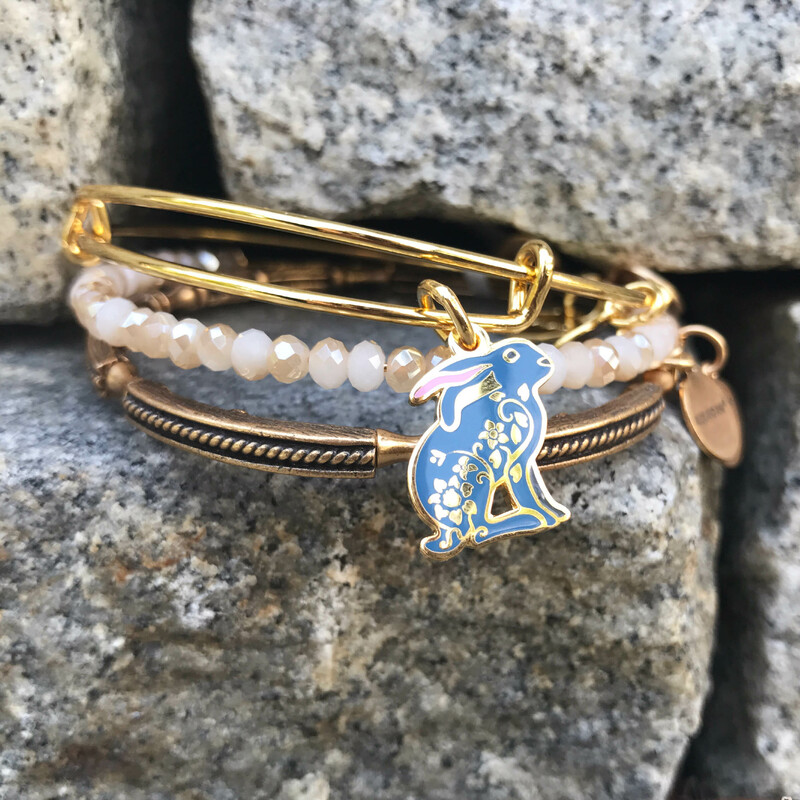 This bangles gives back to SOS Children’s Villages, who work to build families for children in need. The Print of Love Charity by Design bangle has been updated with a heart-shaped Swarovski crystal to add a little extra sparkle. 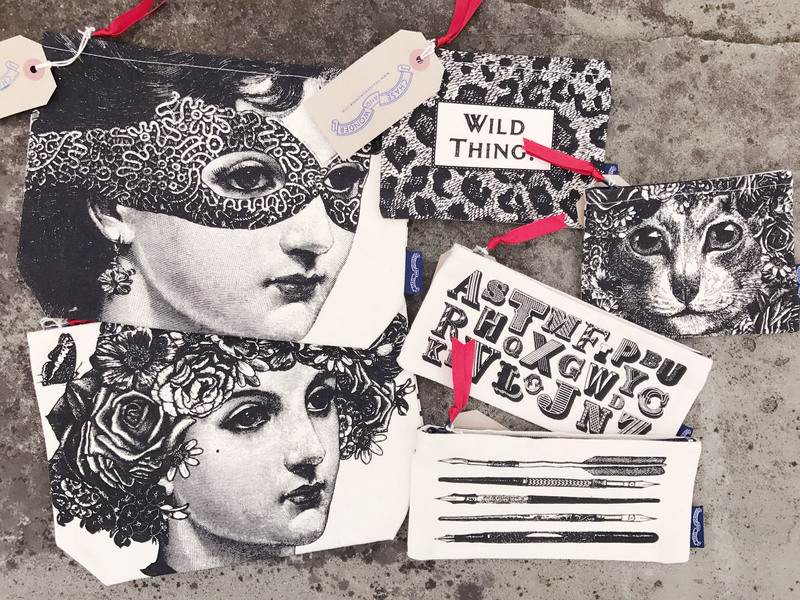 The new Prints of Love, like the old, gives back to the ASPCA. The Apple and the Dolphin have moved from the core collection to the Charity by Design collection. 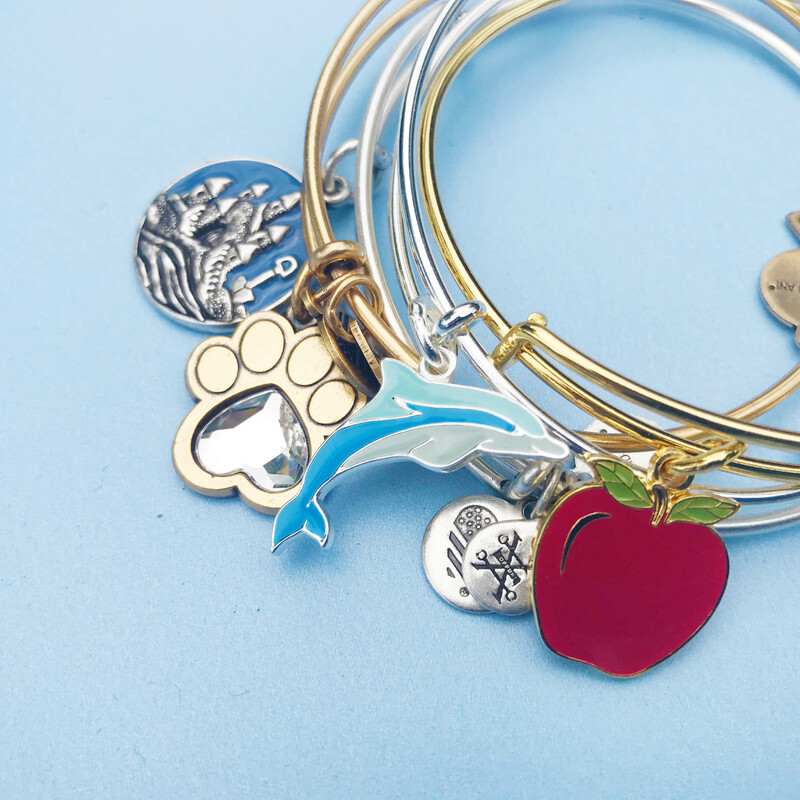 Now when you buy your favorite teacher the Apple bangle, not only are you giving her a heartfelt gift, you are giving back to Blessings in a Backpack to provide meals for underprivileged children. The Dolphin teaches us to have a playful heart- what better way to honor this than to give back to the Association of Zoos and Aquariums to rescue and rehabilitate marine animals and provide joy and education to the next generation. 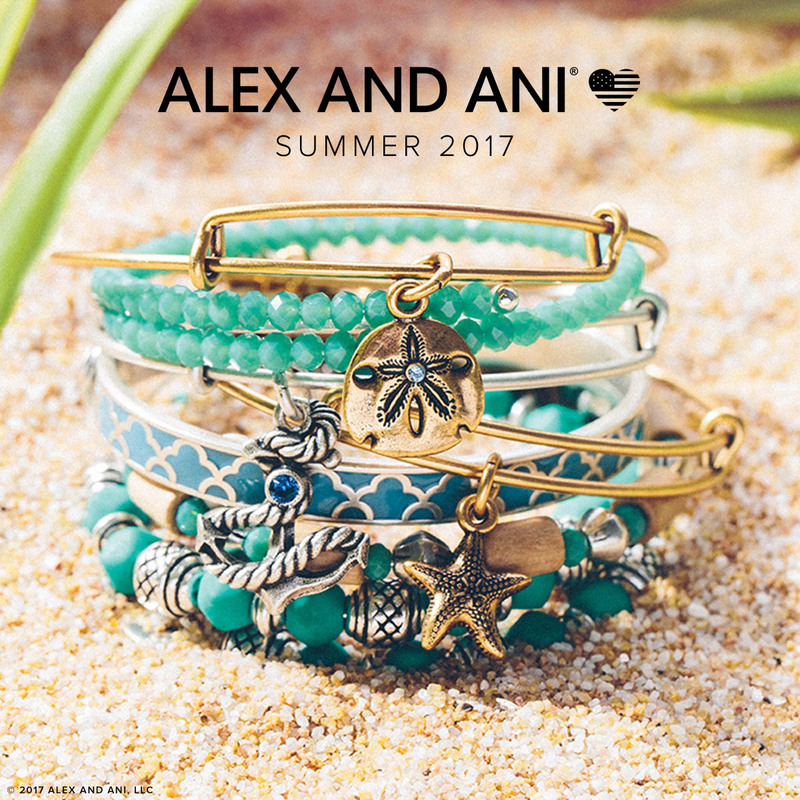 The Alex and Ani Summer collection also includes some fun new Limited Edition sets. 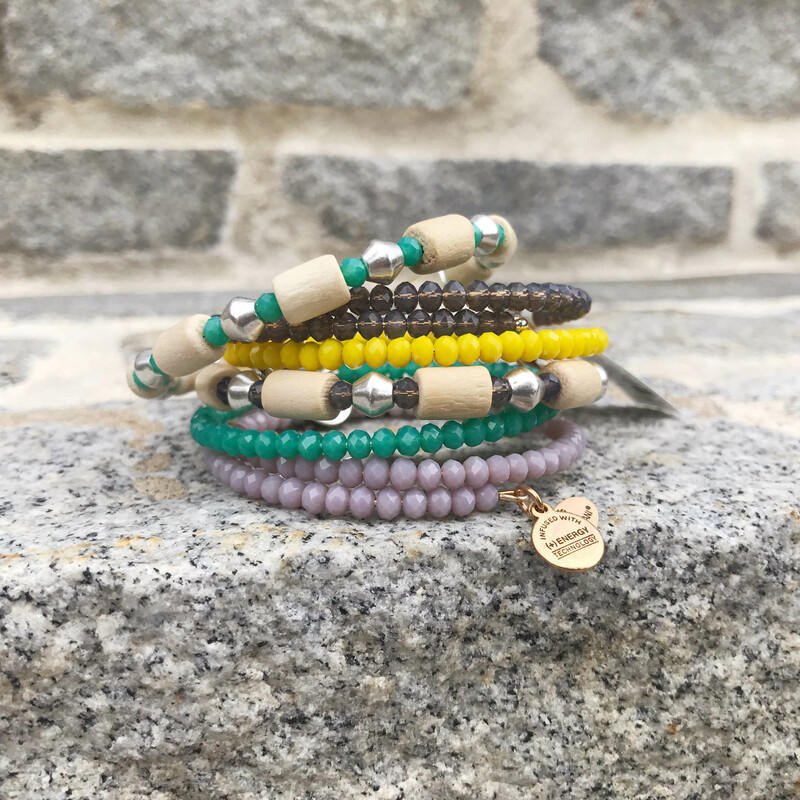 Sets make a great gift, as they include a Limited Edition bangle and beaded bracelets to form a complete stack. The Limited Edition summer bangle sets include a set of five in shiny gold and a set of three in shiny silver. The set of five includes an enamel Puffer Fish bangle. This shiny gold set is accented in cotton candy colors with light pinks, seaglass blues, and sunny yellows. The set of three includes an enamel sailboat bangle in shades of blue and white. 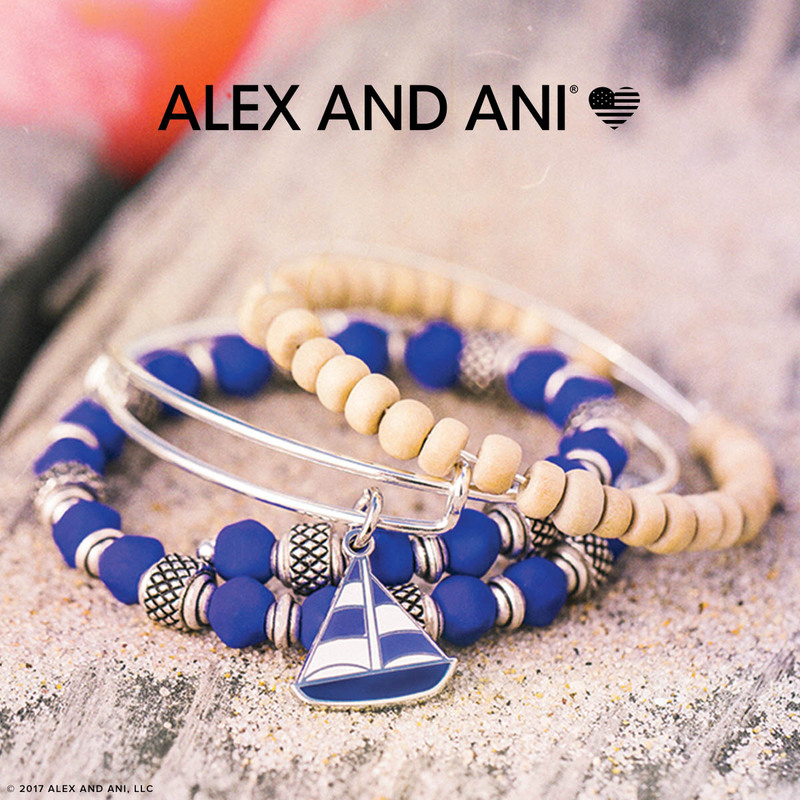 The sailboat is accompanied by beaded bangles in bright blue and natural wood accents. In addition to the summer sets, the June Limited Edition set also has an ocean-inspired theme! This set of two is available in the shiny silver finish and features the Path of Life. A great symbol for grads, the art infusion Path of Life has been illustrated with a nautical style. Mum’s the Word- Our Mother’s Day Gift Guide is Here! Mother’s Day is just around the corner, and we have hand-selected some special treats to make mom’s day! Whether she is a sentimental soul or a trendsetter on-the-go, we have searched the world to find the perfect gift for every kind of mom. Check out all of our selections below in our Mother’s Day gift guide. A few helpful hints before we start- plan to shop before the crowds arrive. The early bird really does get the worm- many of our promotions are the first week in May and the best selection is available when you get there first. If you are shopping for Pandora or Alex and Ani, take a peek or snap a pic of mom’s collection before you set out. That way you won’t have to fret over whether you have already given her that mom charm! And forget about buying wrapping paper and ribbon- gift wrapping is always complimentary at Versant! Got all that? Okay then- ready, set … shop! 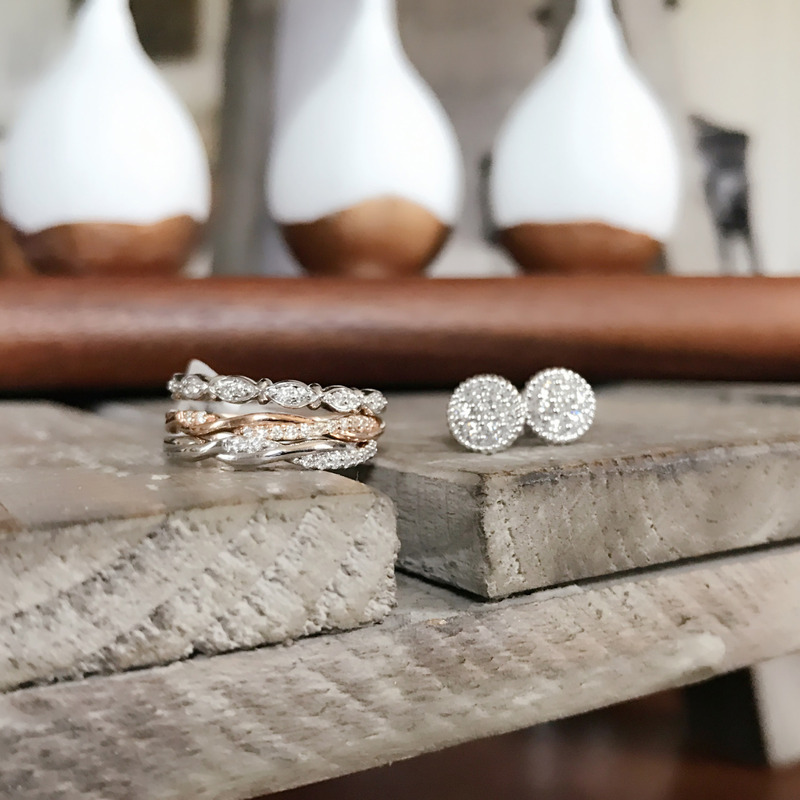 If mom’s sense of style trends towards bright silvers, simple lines, and a touch of sparkle, she appreciates classic beauty. Giving a gift that will stand the test of time means going back to the classics. Clean styles in neutral colors are always a good idea. Mom will get the most wear out of a versatile piece she will be able to fancy up with a little black dress or dress down with a tee and jeans. One of our favorite jewelry lines that creates classic styles with an updated aesthetic is Ti Sento Milano. Crafted from sterling silver, these pieces are rhodium plated to inhibit tarnishing and keep a bright, beautiful finish. Studded with sparkling, handset stones, they are great for transitioning from day into night. 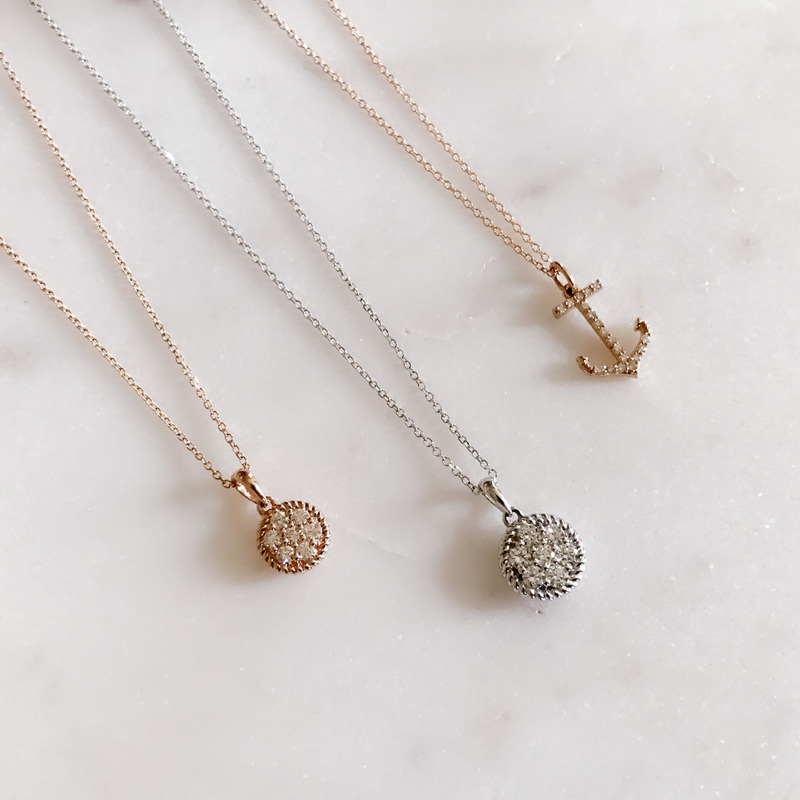 Some of our favorite Ti Sento necklaces feature a round pendant with a pavé CZ or colored stone interior. We love the beautiful, soft colors of the stones. Ti Sento uses manmade crystals for their colored stones, ensuring that the color of each piece is consistent. This is a great feature for buying companion rings or earrings on future occasions! If mom prefers bracelets and rings to necklaces, Ti Sento has some gorgeous hinged bangles. 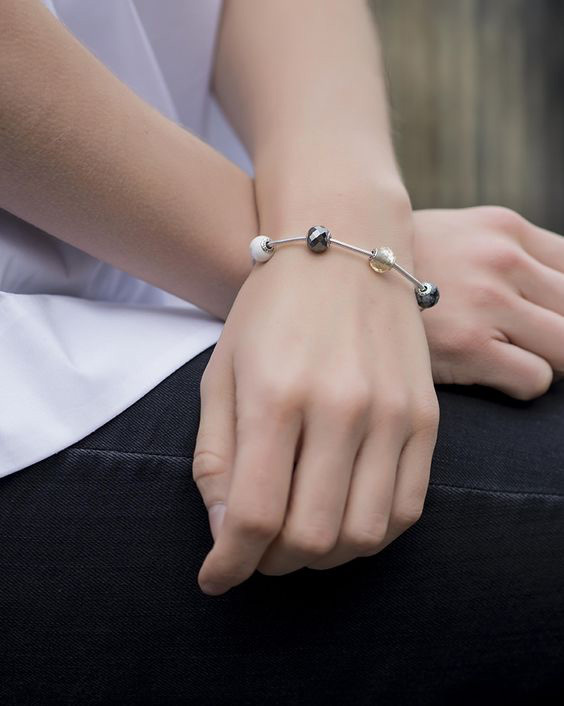 Made from heavy sterling silver, they really make a statement! We love the new spring design with entwined silver, pavé CZ, and mother of pearl strands. Another great choice for the mom with the classic sense of style is Gabriel & Co’s fashion jewelry. Gabriel is primarily known for their high-end engagement rings, wedding bands, and fine jewelry. Their fashion line is constructed from sterling silver with precious and semi-precious stones. Using sterling allows for the same quality of design and construction at a lower price. 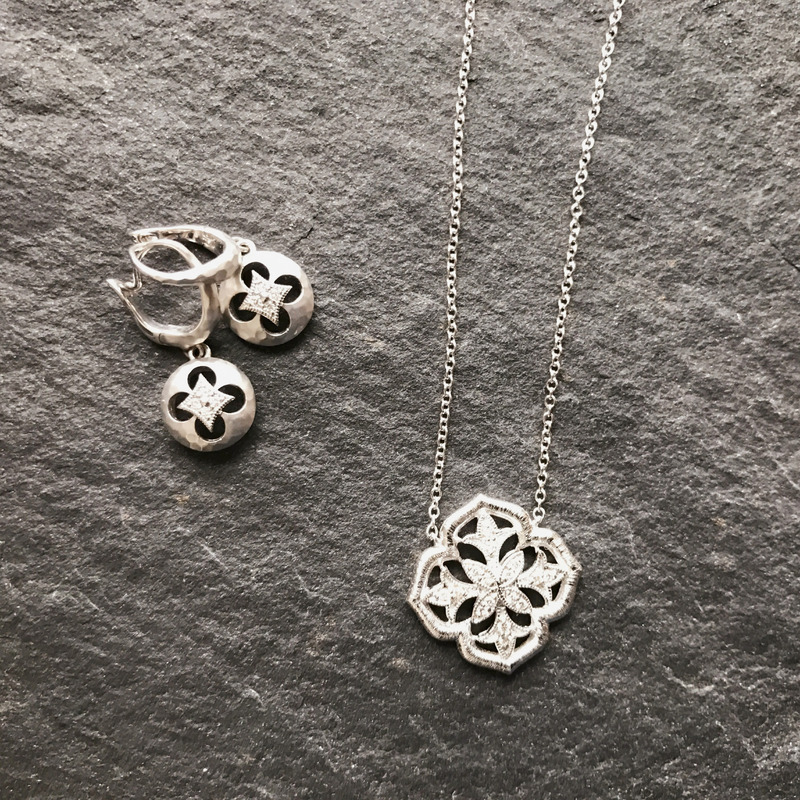 We love their quatrefoil necklace and earrings for mom. An iconic style with a slightly vintage feel, these pieces are feminine without being too delicate. For the mom who likes the classics but wants something unique, Gabriel’s mother of pearl pieces are a great choice. These rings, earrings, and pendants use mother pearl with a piece of faceted quartz on top to give the piece more dimension. Although at first glance they look like a neutral grey, the iridescence of the dark mother of pearl picks up pretty pinks, greens, and other colors in the light. Are you looking to really treat mom this Mother’s Day? (She deserves it!) Nothing is as classic or eternal as fine jewelry. While good fashion jewelry makes a beautiful statement, sterling silver does not have the strength for long-lasting wear the way that gold does. To give mom a classic piece that she will be able to wear for years and pass on to her children, gold is the way to go. For a gift that mom can wear every day, stud earrings are an excellent choice. They have just the right amount of sparkle to be able to worn with any outfit. Studs are a great gift for new moms because they are a piece of jewelry that small hands can’t easily grab! A dainty necklace is also a wonderful gift idea. 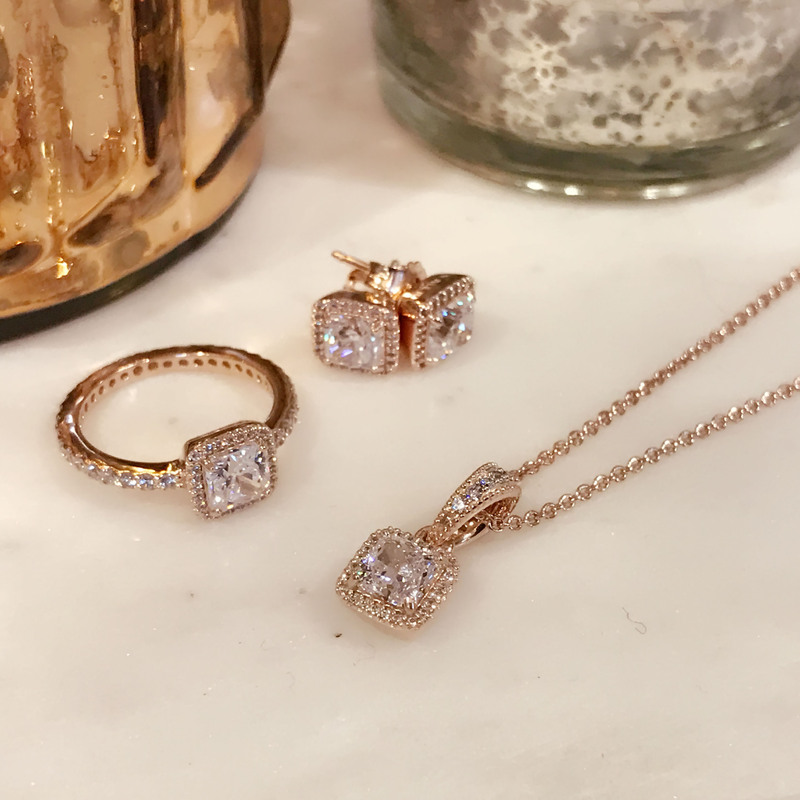 These pieces add a touch of delicate sparkle and will never go out of style. 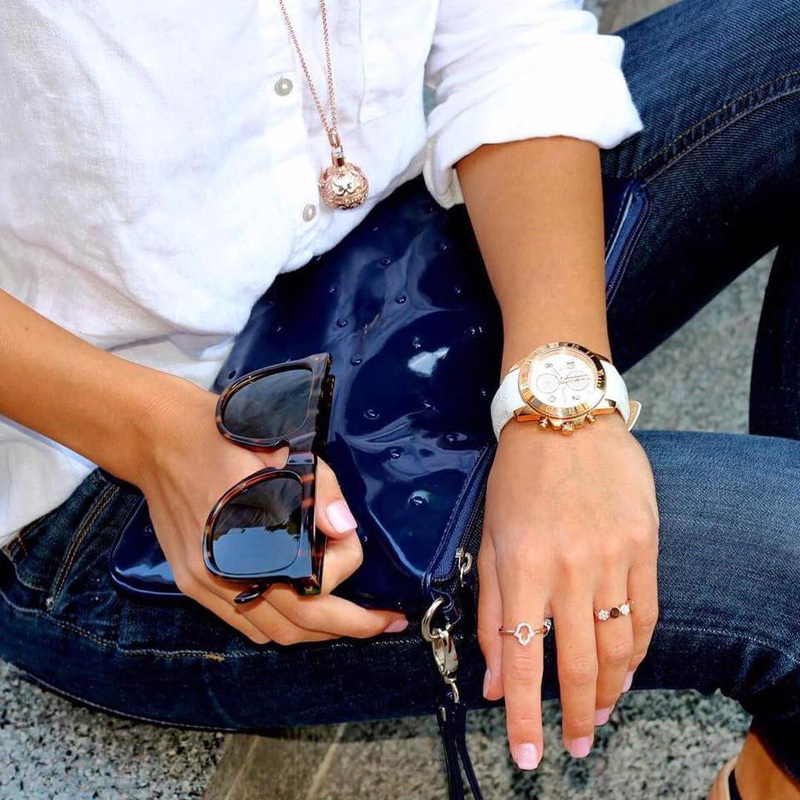 We love the anchor necklace below. A symbol of stability and hope, the anchor holds fast and steady in both calm and stormy weather. We love a gift that you can personalize to customize it to mom’s taste and represent your family and special memories that you share. 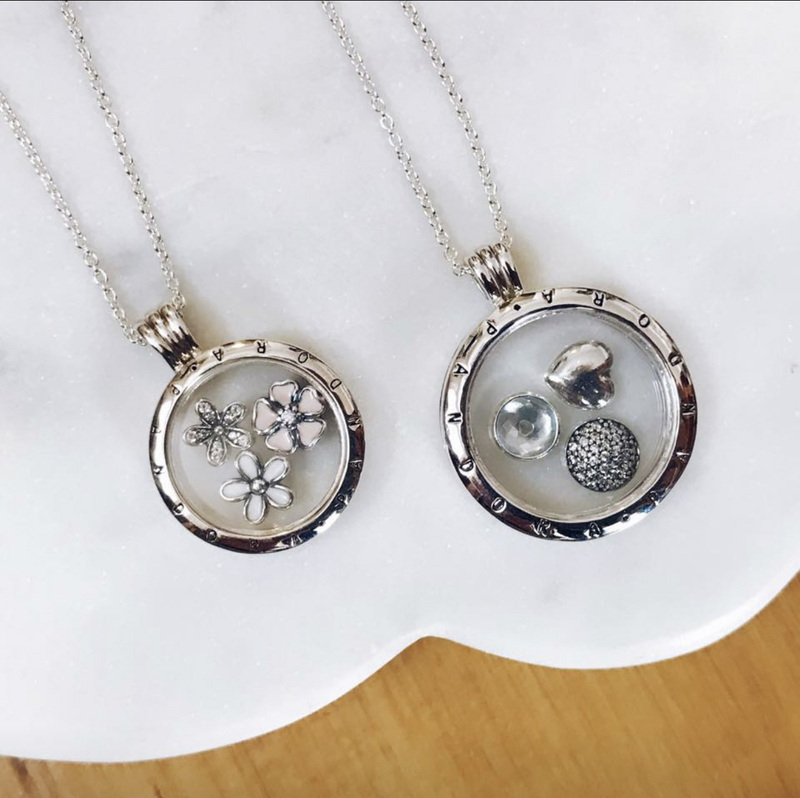 Luckily, there are a lot of different types of jewelry that let you combine pieces to make mom a unique and thoughtful gift. When talking about celebrating and creating unforgettable moments, Pandora is a great choice for someone looking for a wide range of styles. Not only do they have a vast selection of charms for their bracelets, but their jewelry is diverse, well-made, and affordable. 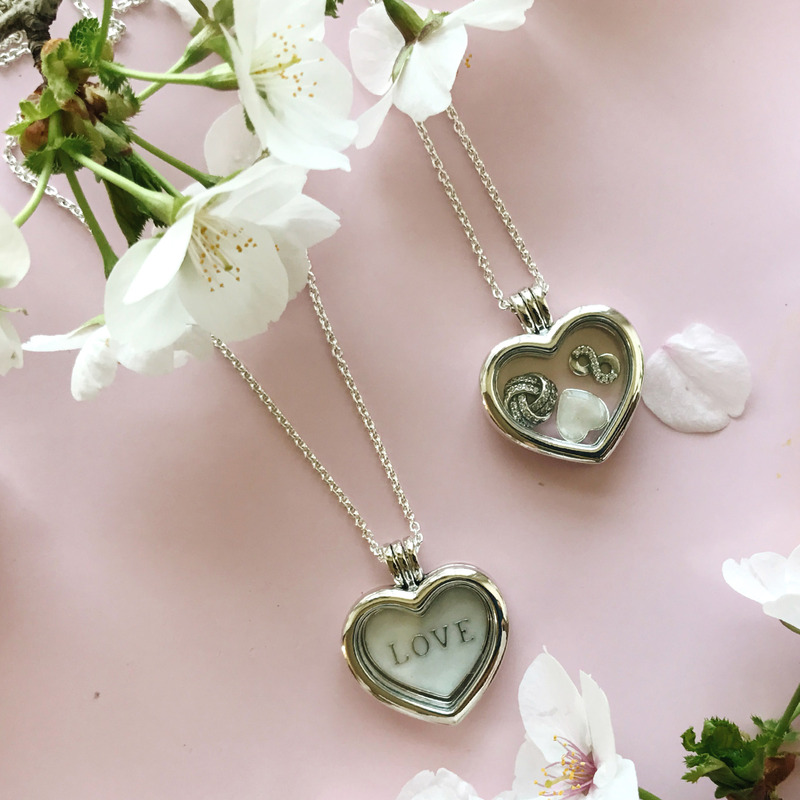 We love the new floating locket designs that have been introduced this season. 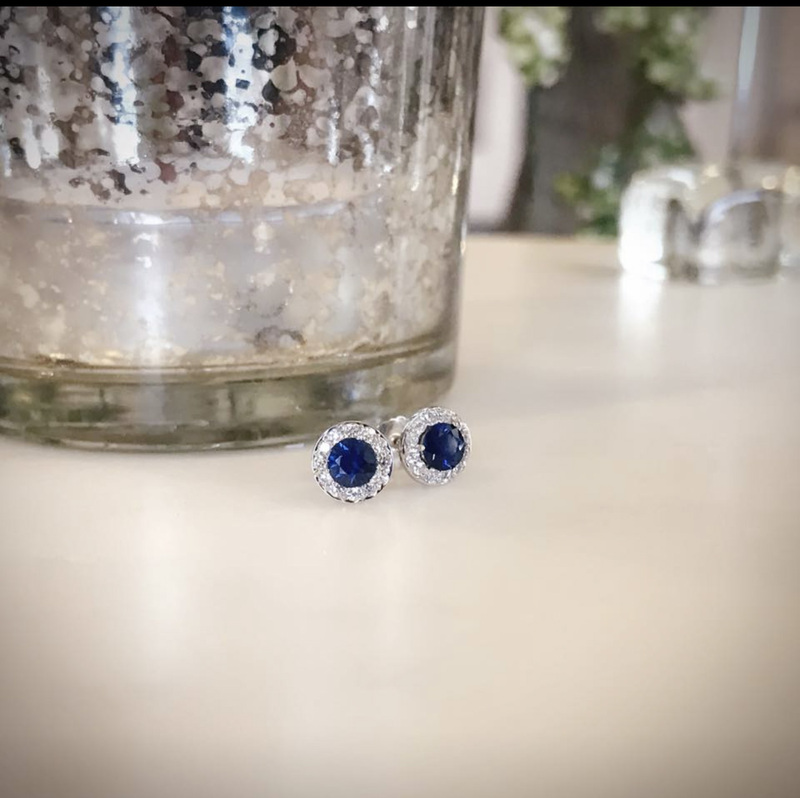 The lockets themselves are a clean, classic design and use sapphire crystal found in high-end watches to provide a scratch-resistant surface. 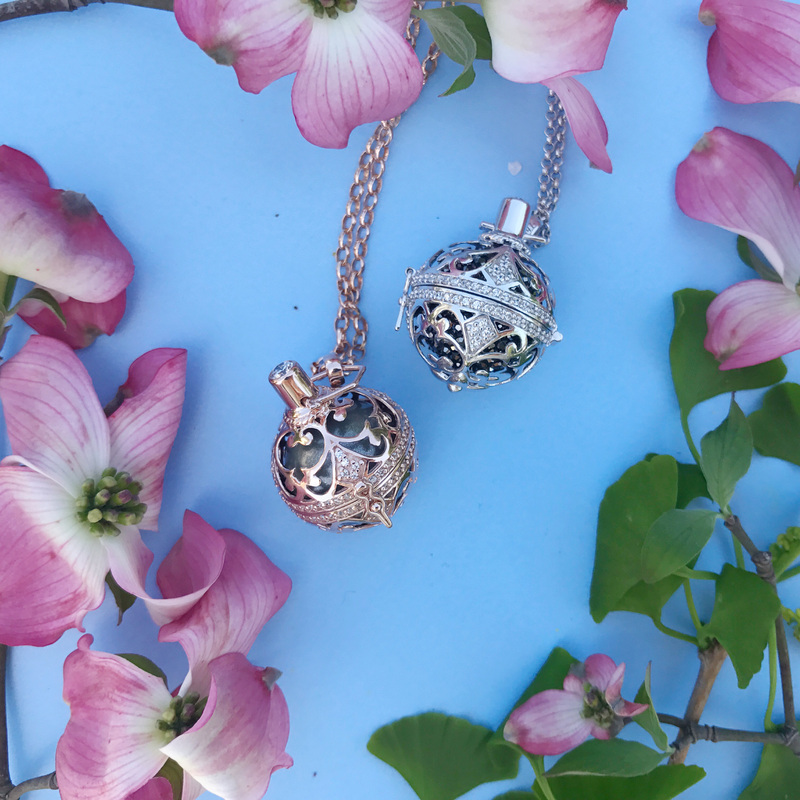 Sets of three petite charms can be used to personalize the lockets. We love the infinite love and the birthstone trios! The new heart lockets can be used with an insert plate in the back to add another dimension to the design. For those looking to start a Pandora bracelet or add a new bracelet to their existing collection, the Tree of Hearts gift set is a great way to do so. 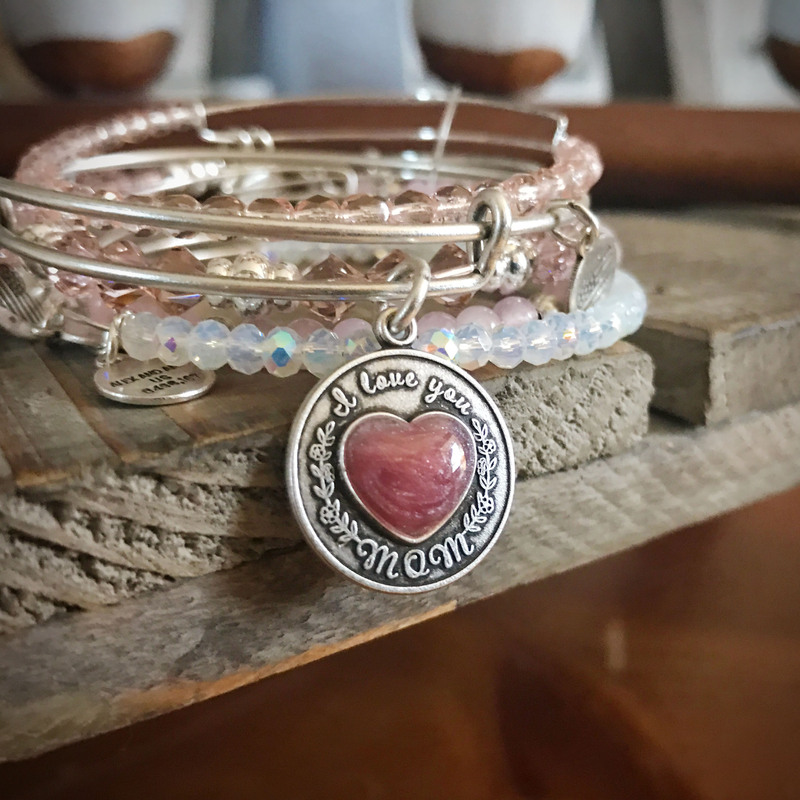 This set includes a Limited Edition heart-clasp bangle with the inscription “You are so loved” and the new Tree of Hearts charm. The gift set is presented in a special light pink Pandora box. Personalize the set by adding spacers in the colors of family members’ birthstones or charms with their initials! 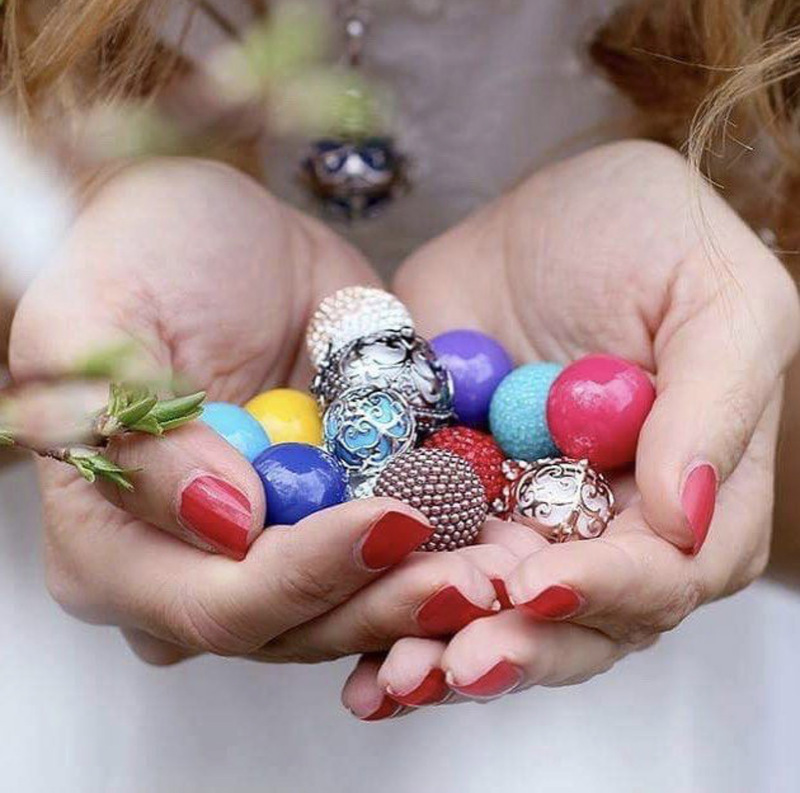 Pandora’s new stackable birthstone rings are another great option for giving mom a personalized gift. Make a stack with the birthstone of each family member to create a modern version of a mother’s ring. Another great option for curating a personalized set for mom is Waxing Poetic jewelry. 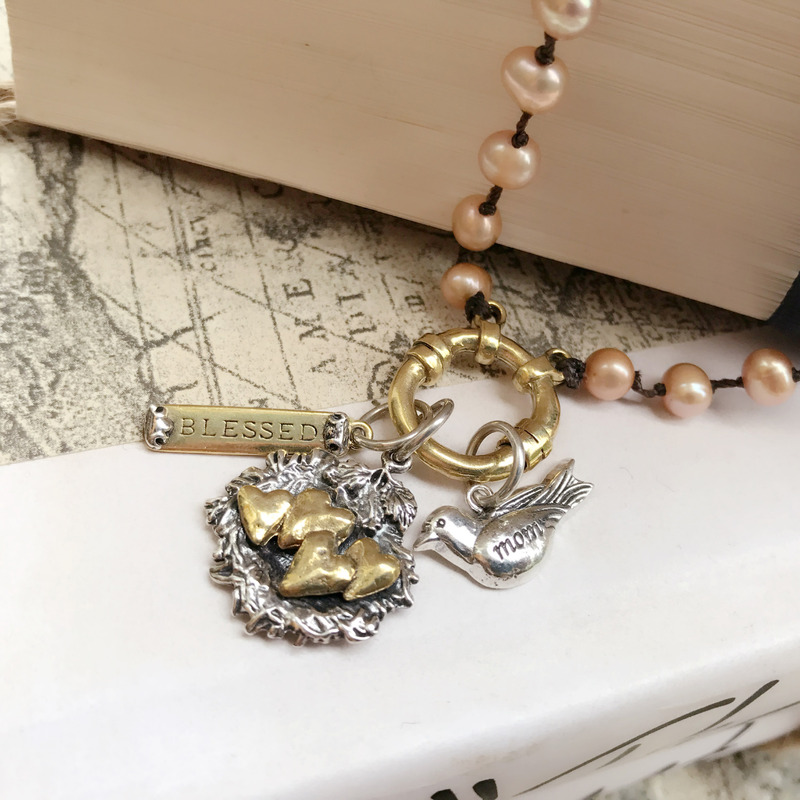 This line of charms, necklaces, and bracelets is inspired by vintage wax seals. Create a mother’s day collection using talismans representing family, meaningful words and phrases, and insignia with initials. An added bonus to shopping the Waxing Poetic collection is the free charm promotion that will be going on from May 1-May 14. During this time, when you spend $100 in Waxing Poetic jewelry, you will get a Mom Birdsong charm for free. We love this charm paired with the Bundled with Love nest. Add symbols representing each family member to really personalize mom’s charms! 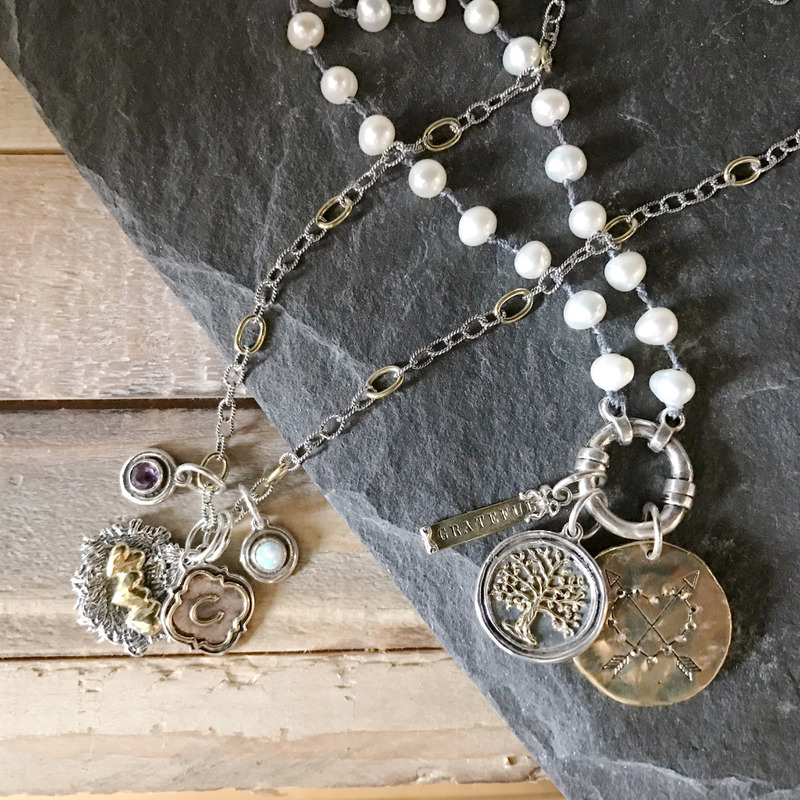 Waxing Poetic Pearl Necklace w/Charm Catcher and Charms. Mom Birdsong Charm (free with purchase of $100 or more from May 1-14) on far right. 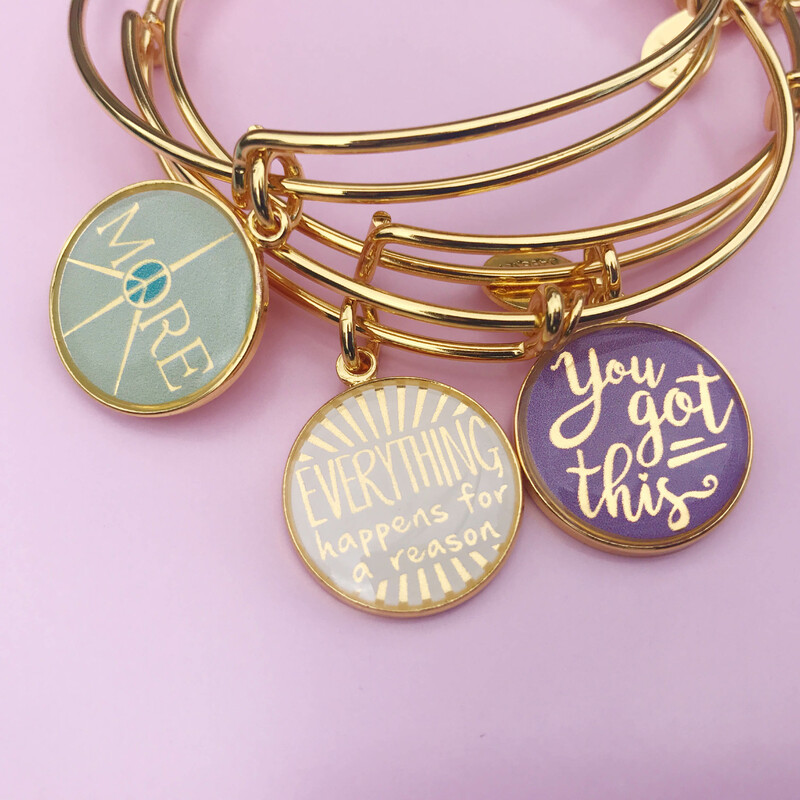 For the mom with a more casual style, Alex and Ani is a fun way to create a stack of bracelets to represent her family and what makes her stand out. 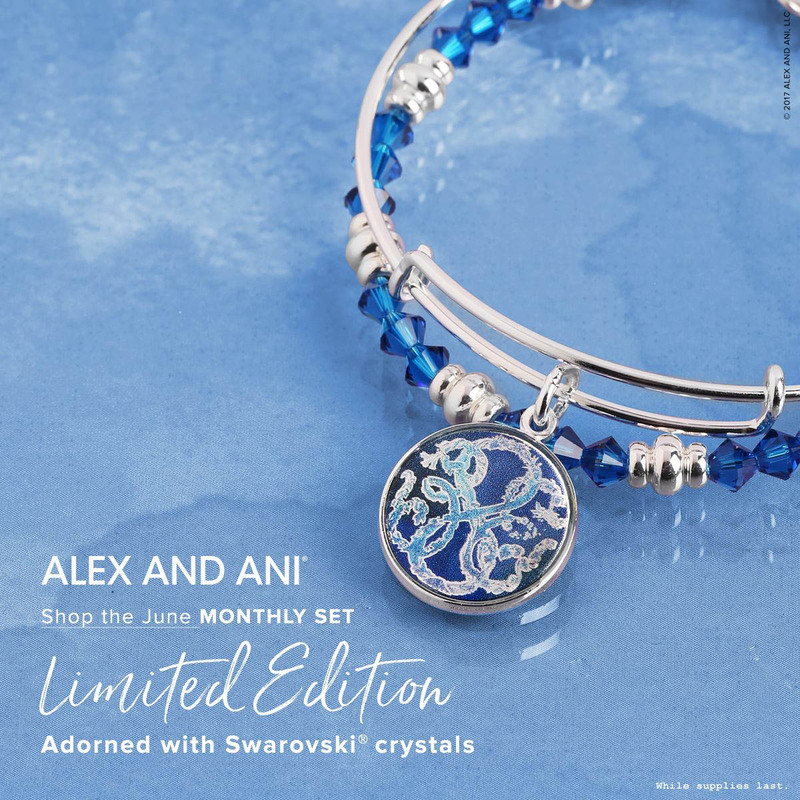 This Mother’s Day, Alex and Ani has released several limited edition sets. 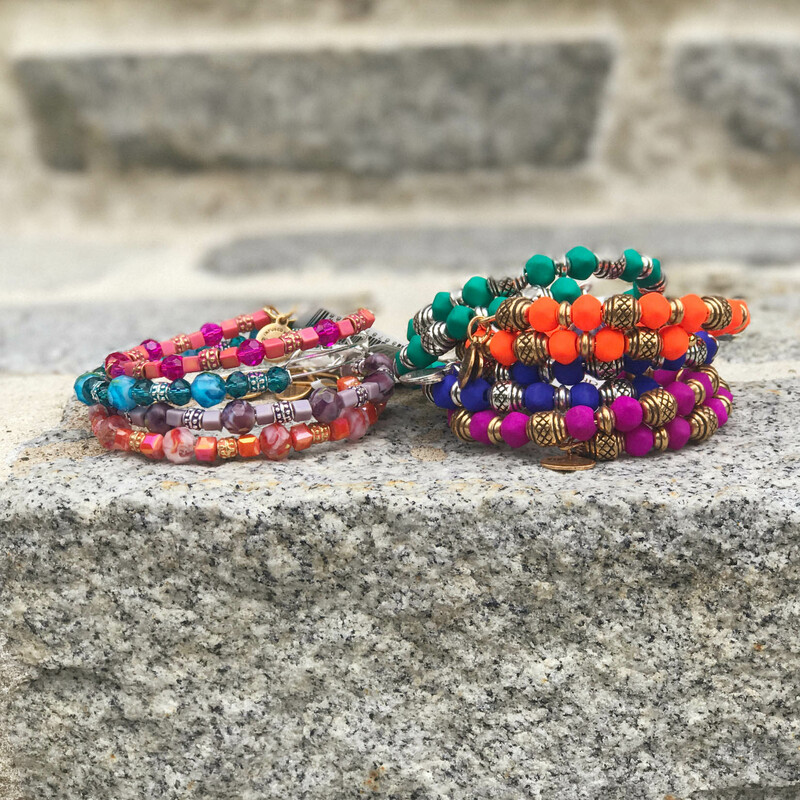 These bangle and beaded styles only available for a limited time as part of each set. The I Love You Mom set of five and Mom set of three are great starter sets for a mom just beginning her Alex and Ani collection. We particularly love the Infinite Connection set. 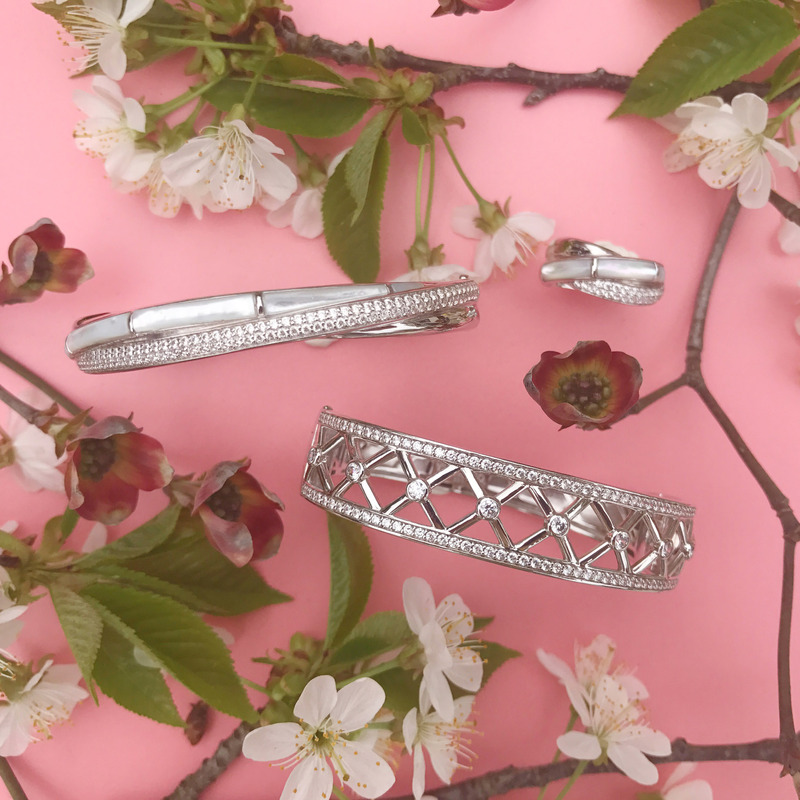 With one bangle for mom and one bangle for daughter, it reminds us of the classic “give one, keep one” friendship sets. 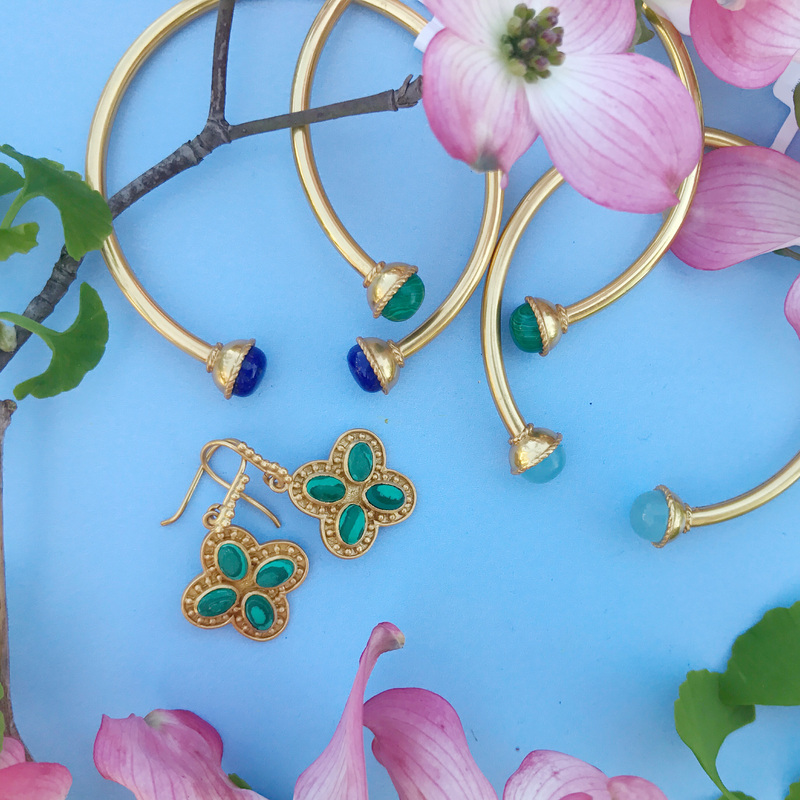 Add a beaded bangle in a birthstone color to personalize mom’s portion of the set! 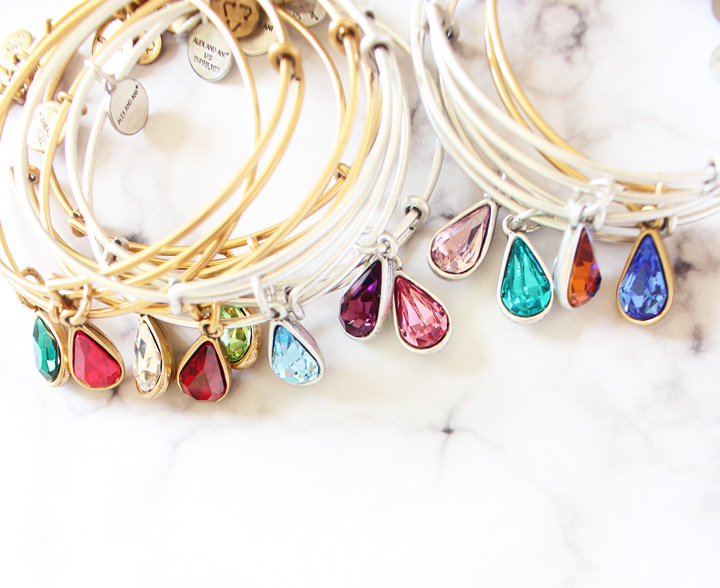 Another way to create a personalized bracelet collection is with the updated birthstone bangles. 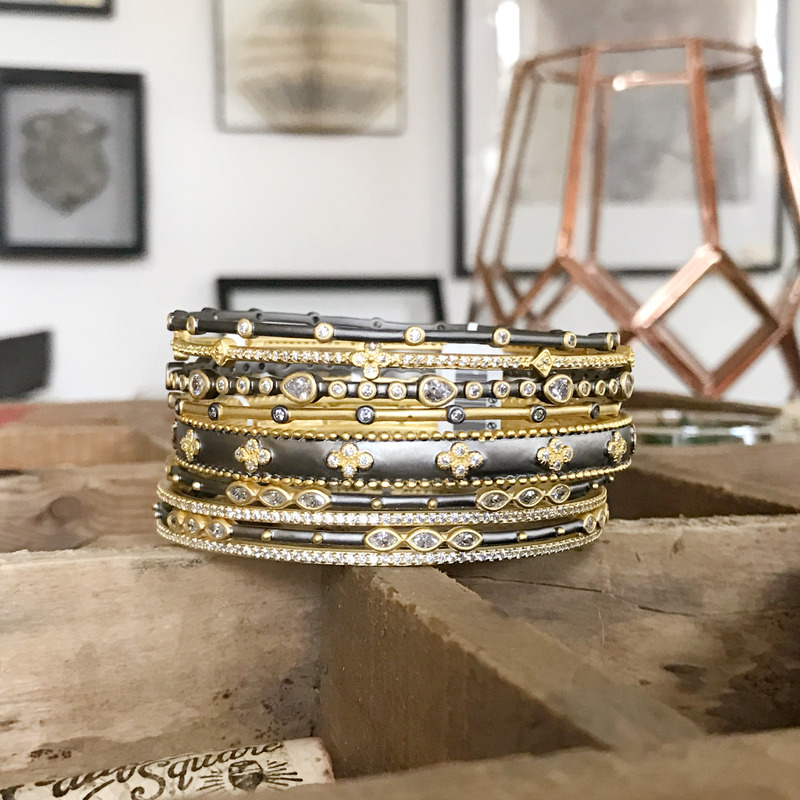 These bangles are now available in the matte gold and silver finish and adorned with a teardrop shaped Swarovski crystal. 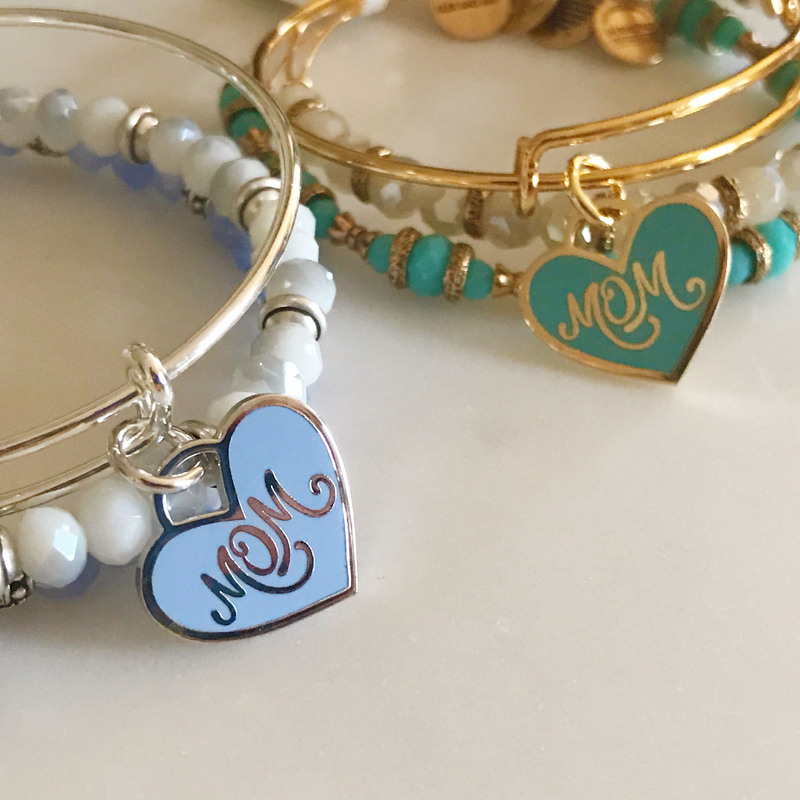 Mix birthstones bangles, colored beaded bracelets, and initials for mom and her crew to create a varied stack. Is mom the superhero of your family? Add one of the new Wonder Woman bangles or cuffs to her Mother’s Day stack! 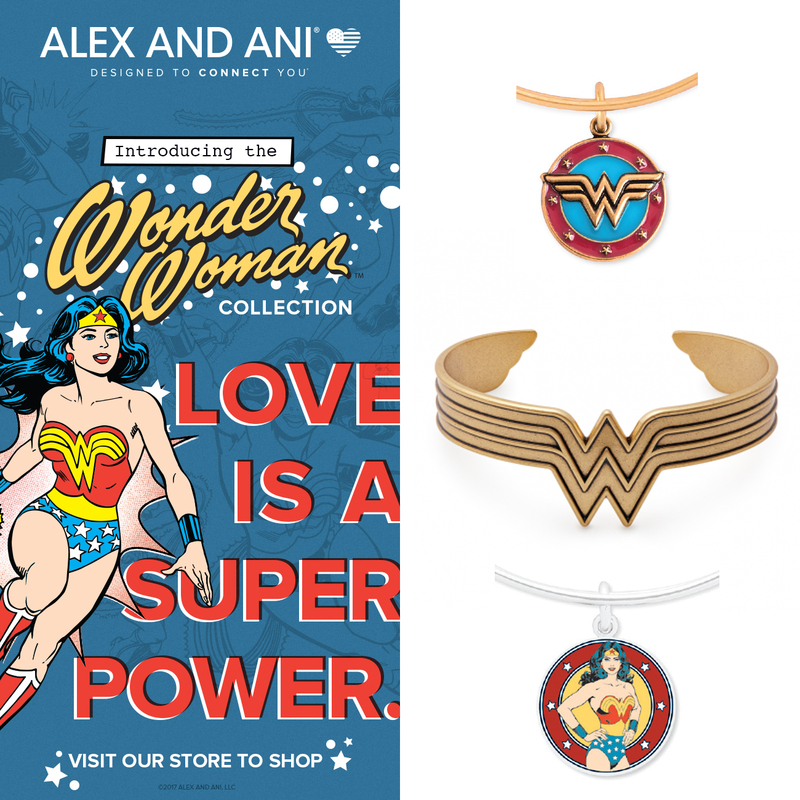 These new additions to the Alex and Ani world feature the iconic Wonder Woman logo and symbolize strength and the fight for love and justice. Is mom a style trendsetter who loves to be on the cutting edge of what is new and fashionable? Look for pieces that use different metals in innovative ways and go out of their way to make a statement. Bolder earrings in versatile designs, necklaces that are longer or shorter (think chokers! ), and stacks of fun bangles are a great way to gift the trendsetter mom. We love Julie Vos jewelry for a striking design in warm gold with pops of bold color. Her long layering necklaces and stackable bracelets have been very popular on the fashion blogs, and for good reason. With styles inspired by nature, architecture, and byzantine motifs, these pieces bridge the gap between classic and trendy. Julie Vos’ jewelry is constructed from 24K gold over brass, giving it a wonderful warm tone. 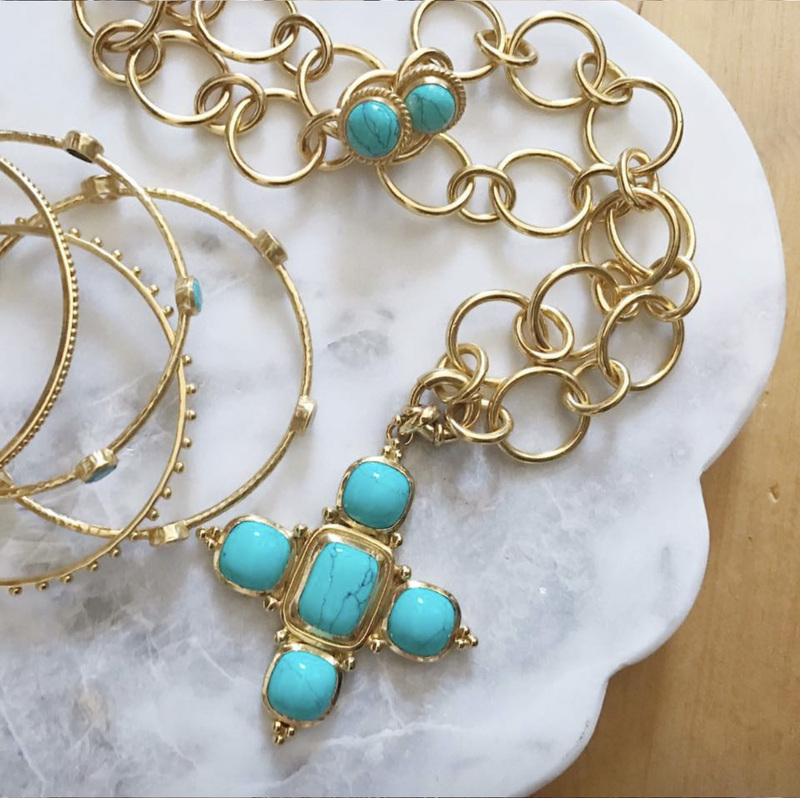 For the beach-loving mom that loves the summer sun, choose pieces where watery blues or bright turquoise are set against gold. 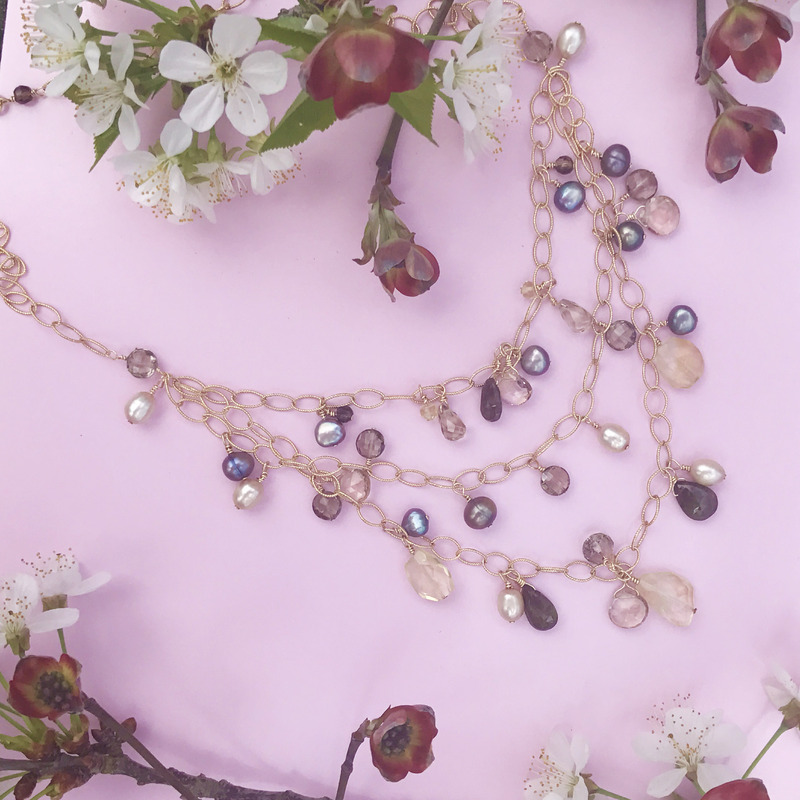 Many of Julie Vos’ long necklaces, like the bee below, include a special jump ring so that they can be doubled and worn at a shorter length. Another great brand for the trendsetter mom is Freida Rothman. Based in New York, they combine a metropolitan style with a fun use of mixed metals and stone settings. 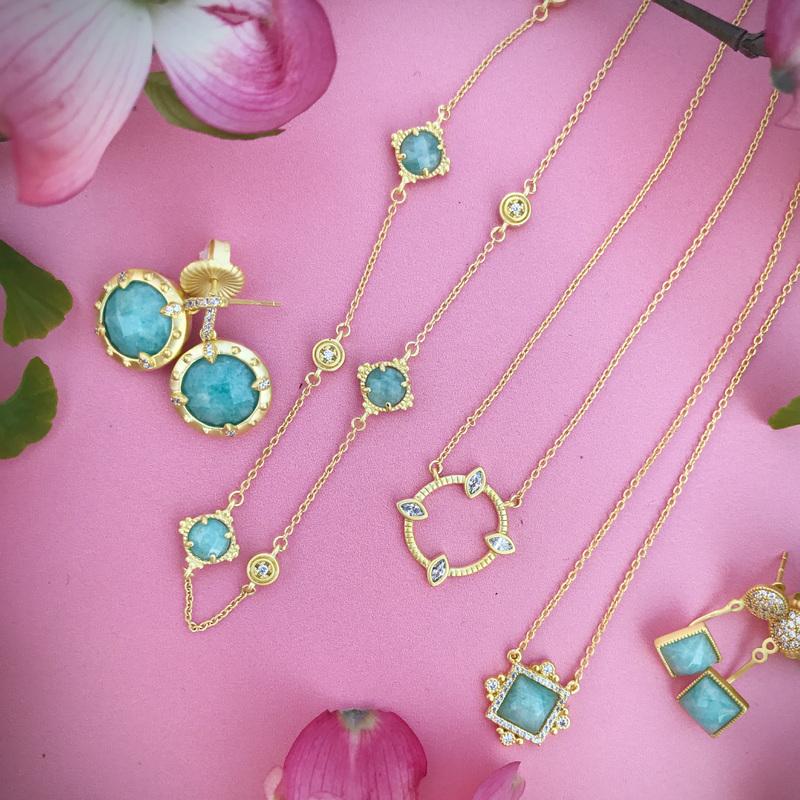 For a brighter style, their yellow gold plated pieces set with amazonite are gorgeous. For a versatile piece, we love their pavé studs with amazonite ear jackets. Wear them as plaint studs without the jackets, or dress it up with a dangling pop of color! For an edgier style, check out Freida Rothman’s mixed metal pieces. 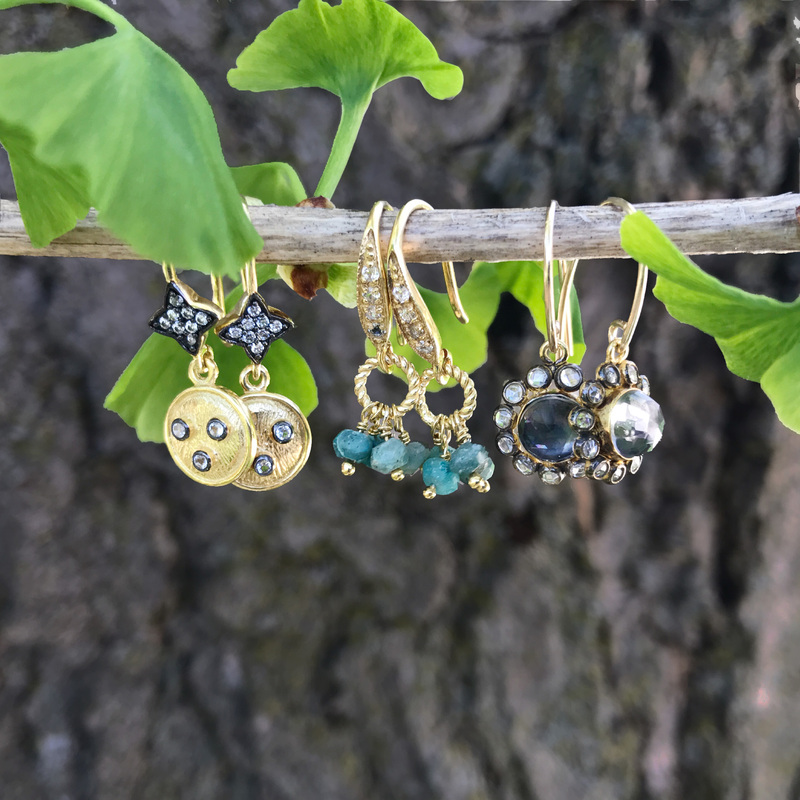 Using yellow gold plating and oxidized sterling silver gives a great contrast to these fashionable pieces. 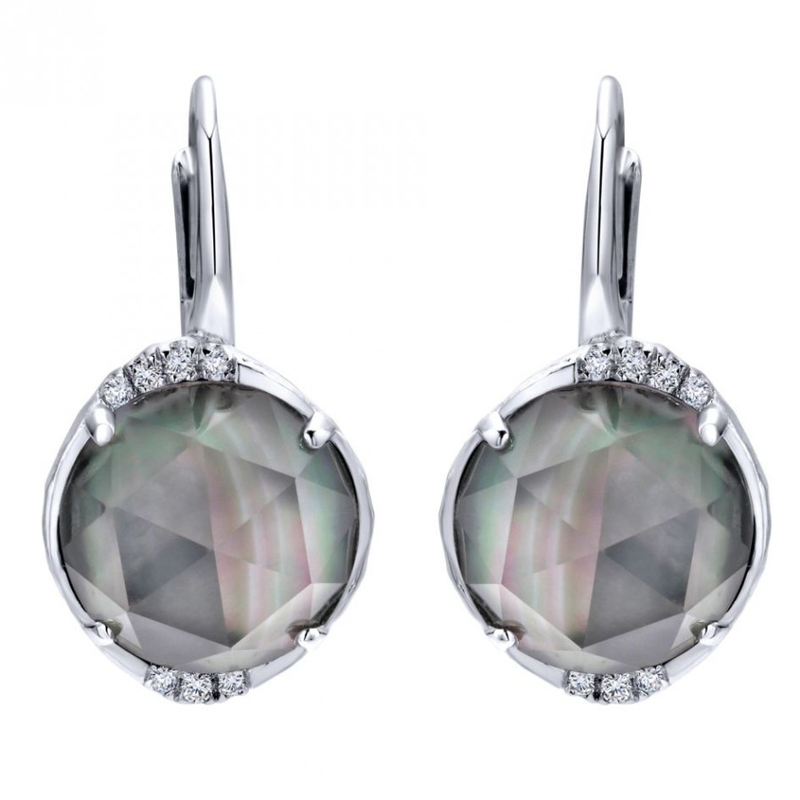 Pair them with some labradorite jewelry to complement the color combination. 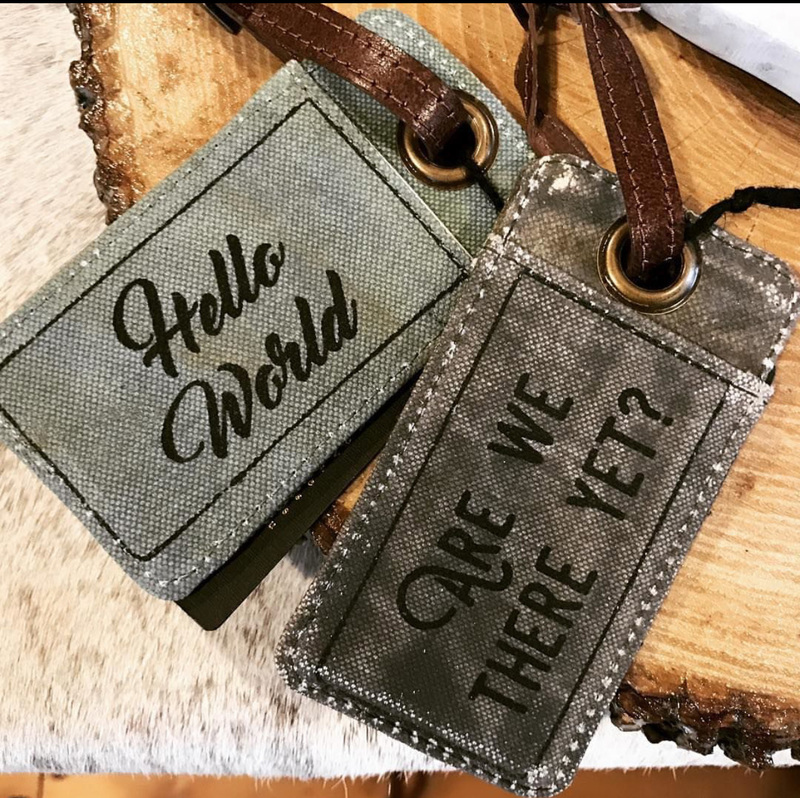 Our store exclusive line, WinterLemon, also has some beautiful one-of-a-kind pieces that are well-suited for the fashionable mom. Handmade locally, they use a mix of cutting edge shapes and metals with semi-precious gemstones. As with Freida Rothman’s jewelry, the mix of yellow gold and oxidized silver takes a classic design and gives it a more contemporary edge. 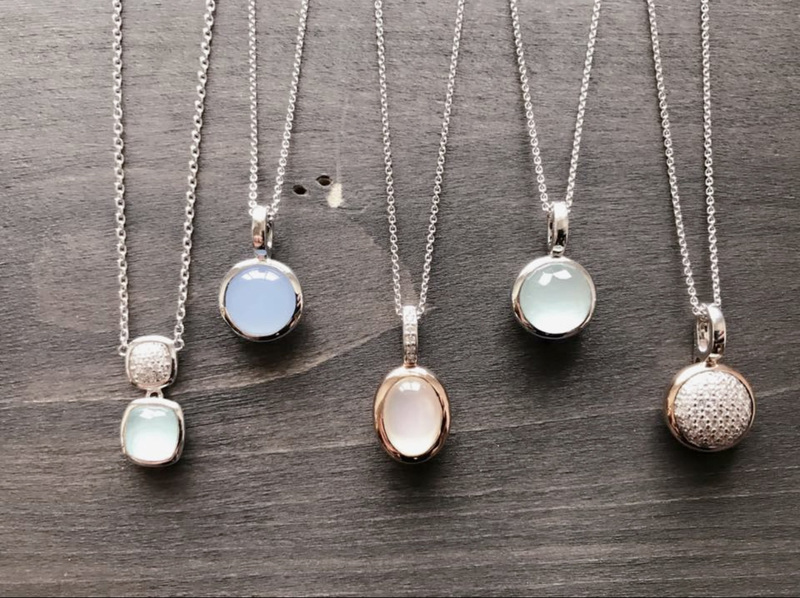 For those that would like a statement piece without a heavy look, we love WinterLemon’s necklaces crafted from a delicate chain, freshwater pearls, and faceted gemstones. Another way to make a statement without being too bulky is to use an unconventional necklace length or a adding bright colored stones set without a large amount of metal. 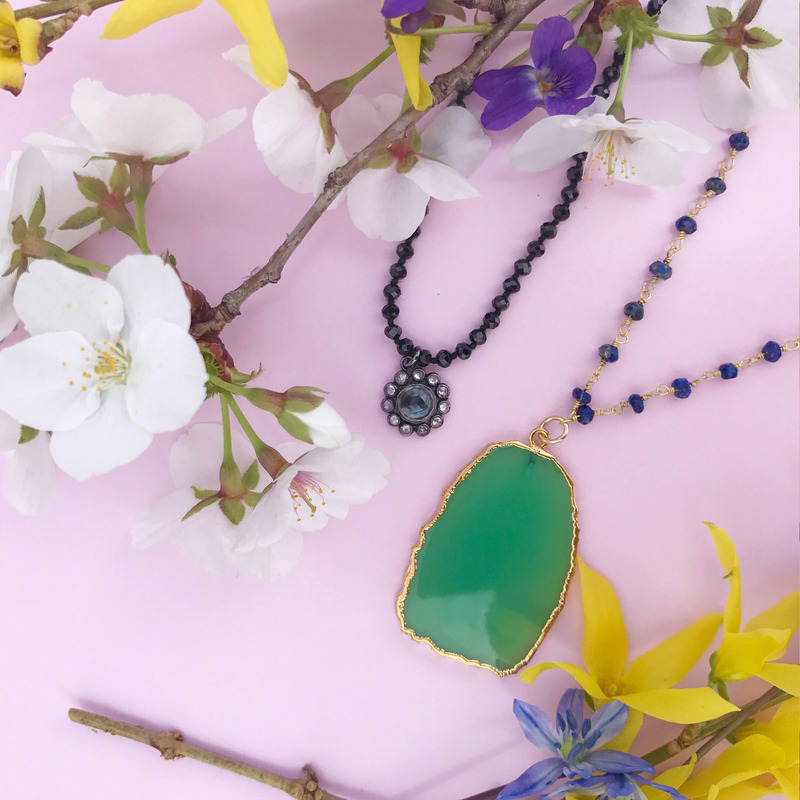 We love this necklace with a slice of bright green chalcedony wrapped in a fine outline of gold vermeil. Is mom known for being softhearted and turns to mush over a gift with a story behind it? For the sentimental mom, we love pieces that have a romantic or nostalgic undertone. Both beautiful and meaningful, Thortiuda pendants are a terrific gift for the sentimental mom. Thortiuda, meaning “angel” in Thai, are also known as angel whisperers. Each pendant cage encloses a colored chime. The delicate chime is meant to call our guardian angels to our side, so that they can protect us from all dangers. Thortiuda is also the perfect gift for a mom-to-be celebrating her first mother’s day. The idea of the angel whisperer chime has been present across many cultures. It was worn during pregnancy to protect expectant mothers and their babies. After birth, it could be kept by the mother, or be given to the newborn baby to protect it in its sleep, to soothe it with the reassuring and familiar gentle chime, and to protect it by calling the invisible presence of its guardian angel. Each chime insert color has an individual meaning and sound. 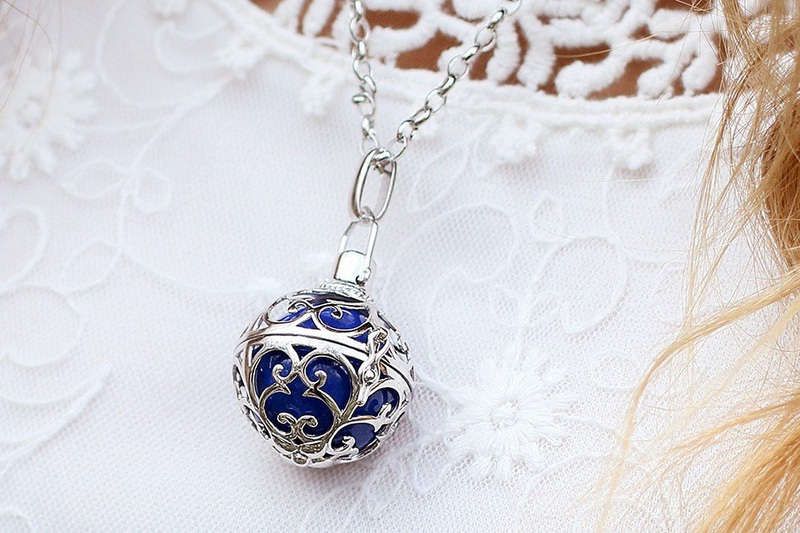 On the fashion side, the interchangeable orbs allow the wearer to change the look of the necklace for different seasons and outfits. Another wonderful way to surprise mom with a sentimental gift this Mother’s Day is through the Pandora Essence collection. Similar to the traditional Pandora charm bracelet, these pieces are personalized by choosing your bracelet and charms separately. However, unlike the Moments bracelet, the Essence charms celebrate different values and attributes of the people we love. Each charm is designed to reflect a chosen trait, such as loyalty or dedication, and this trait is engraved onto the side of the charm. Pandora Essence is wonderful for moms just starting a charm bracelet because the charms themselves have silicon in the interior of the charm that allows the charm to stay in place on the bracelet. This lets mom style the bracelet by grouping charms together or separating them. Because the charms stay in place, the bracelet never looks empty or unfinished. For moms with a distinct romantic side, we love jewelry accented with rose gold. The warm pink tones of rose gold make it a stand-out metal for the dreamy mom. Used widely in the Victorian era, it also has a touch of vintage fun that appeals to the nostalgic mom. 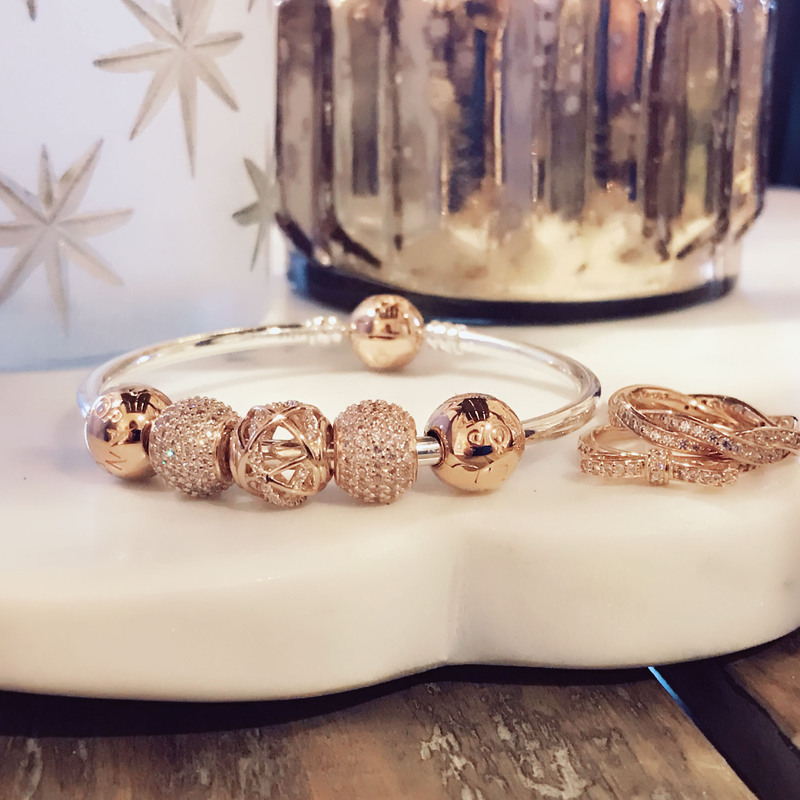 Pandora has recently expanded their collection to Pandora Rose. These pieces are made from a proprietary blend of copper and silver at the core with a layer of 14K rose gold plating on top. We love the pieces with some sparkle- the stones stand out so brightly against the rose! They have designed some of our favorite rings in Pandora Rose as well. Add a rose accent to a sterling stack, or create an all rose collection! To gift mom a full set in Pandora Rose, we love the Timeless Elegance design. This classic style is given a twist with the warm rose gold hue and is available as stud earrings, ring, and pendant. Many of our WinterLemon pieces are also available with rose gold plated accents. 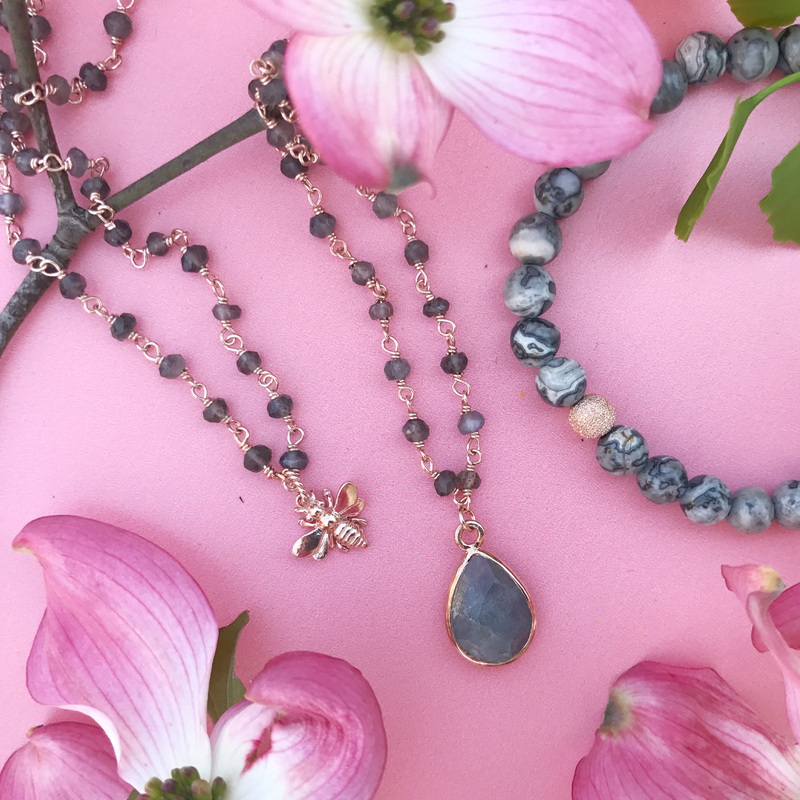 We love the mix of rose gold with the soft grey of labradorite- the iridescence in the labradorite gemstone picks up the warm pinks of the rose. 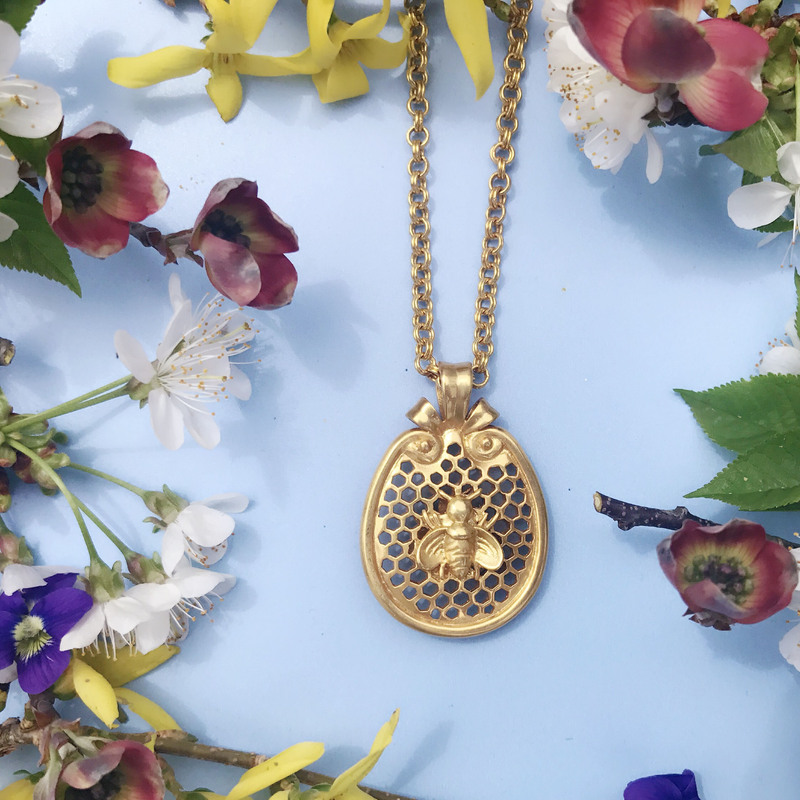 We love the sweet bee necklace below as a dainty piece to honor the queen bee of the family! For a more classic look in rose gold, Elle Jewelry’s rose gold plated sterling pieces feature iconic shapes updated in the rose gold metal. The fleur earrings and necklace are a beautiful romantic style. For a more modern feel, we love the sparkling bar necklace that mixes rose gold with shiny silver. Another way to treat the sentimental mom this Mother’s Day is to feather her nest with some accents that reflect the love of her family. 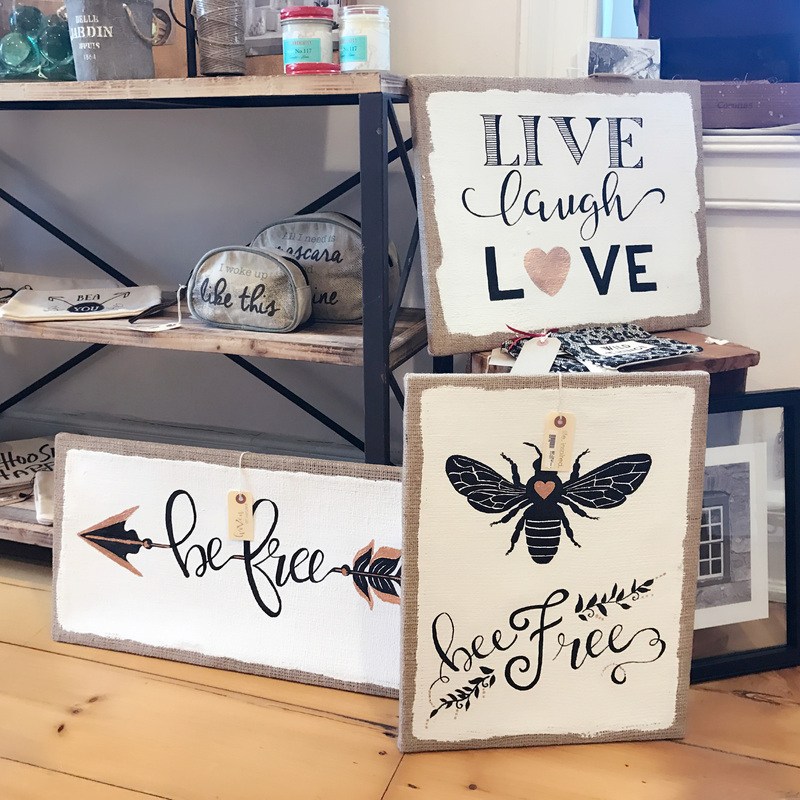 Upstairs in Haven, our locally-made burlap canvases feature a family tree and nostalgic phrases shared between mother and child. 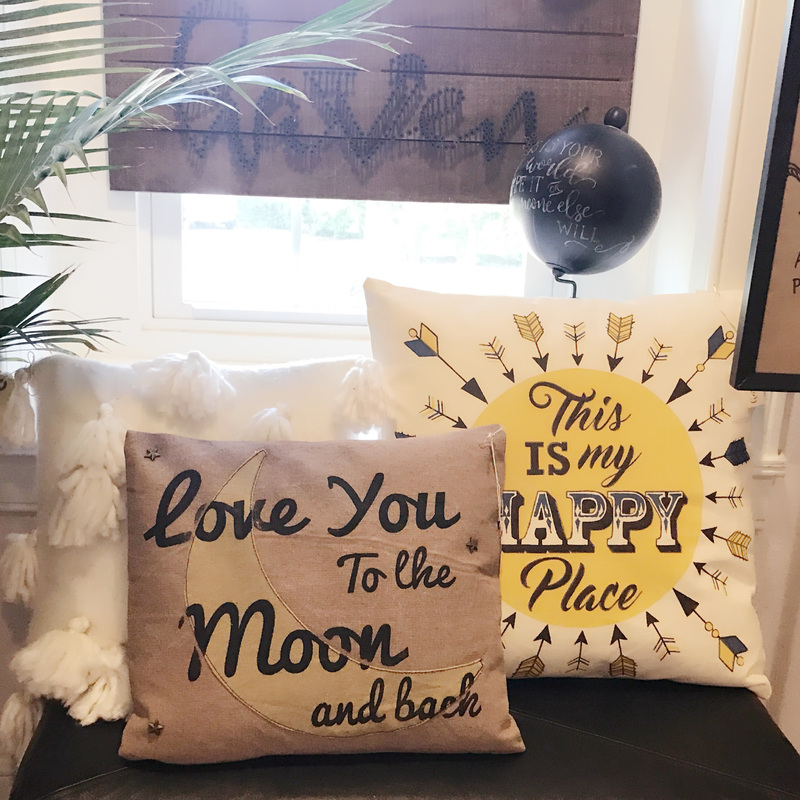 We also love our Love You to the Moon and Back and This is my Happy Place pillows as a way to brighten up mom’s home with expressions of love. Everyone loves gift cards- they are versatile and let mom pick something you know she will like. But as fun as using a gift card is, opening a gift card on Mother’s Day is not very exciting. Luckily, there are some great creative ways to jazz up that gift with some small accessories that give a hint of the gift card being received! Is mom a coffee lover? 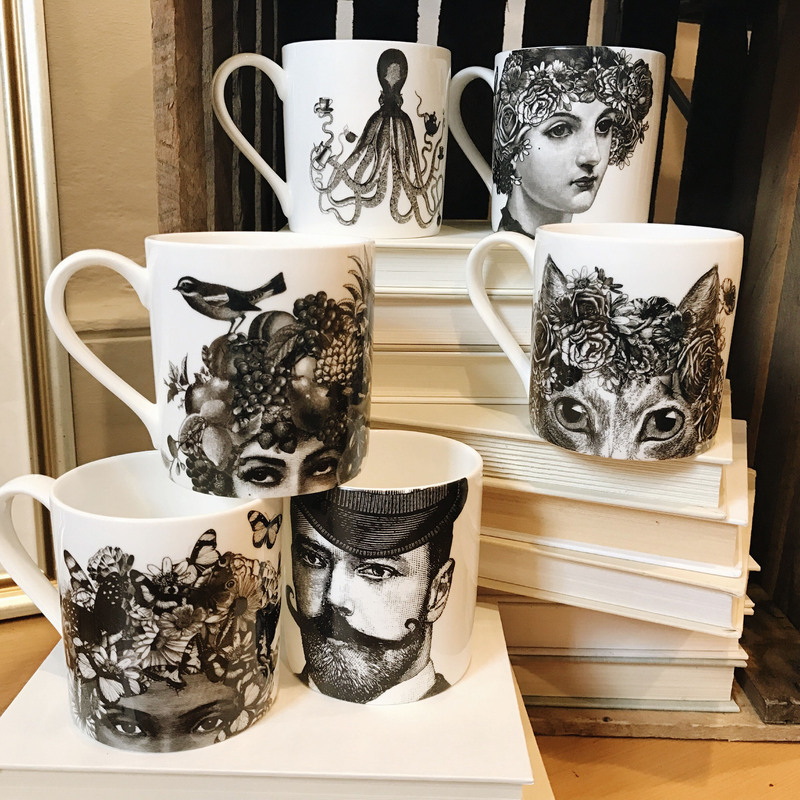 These new mugs from Chase and Wonder are a great way to accessorize a gift certificate to Starbucks, Dunkin’ Donuts, or your local coffee shop. When the gift card is spent, she will still think of you every time she has a cup. 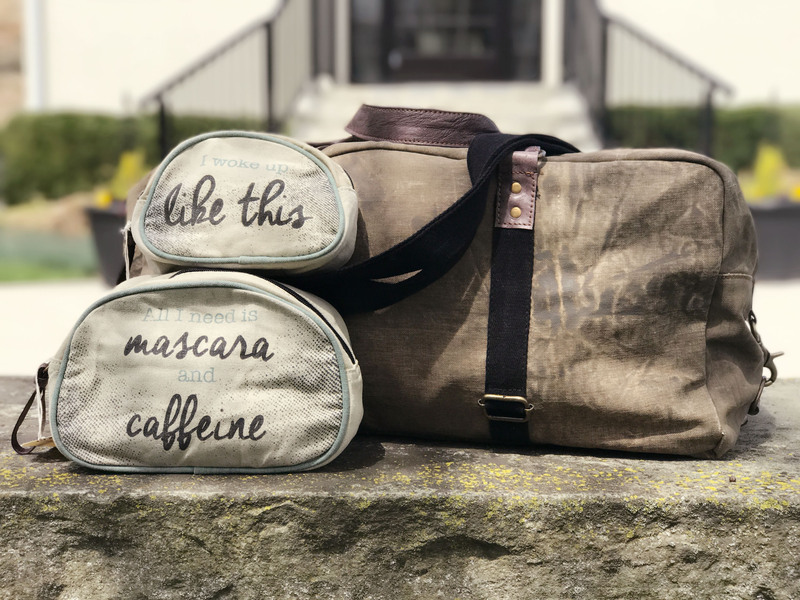 For the mom that loves to travel, these travel bags and accessories made from upcycled military tarps are a great way to surprise mom with a fun trip. The adorable makeup are also a great way to present a gift card to Sephora or Ulta! 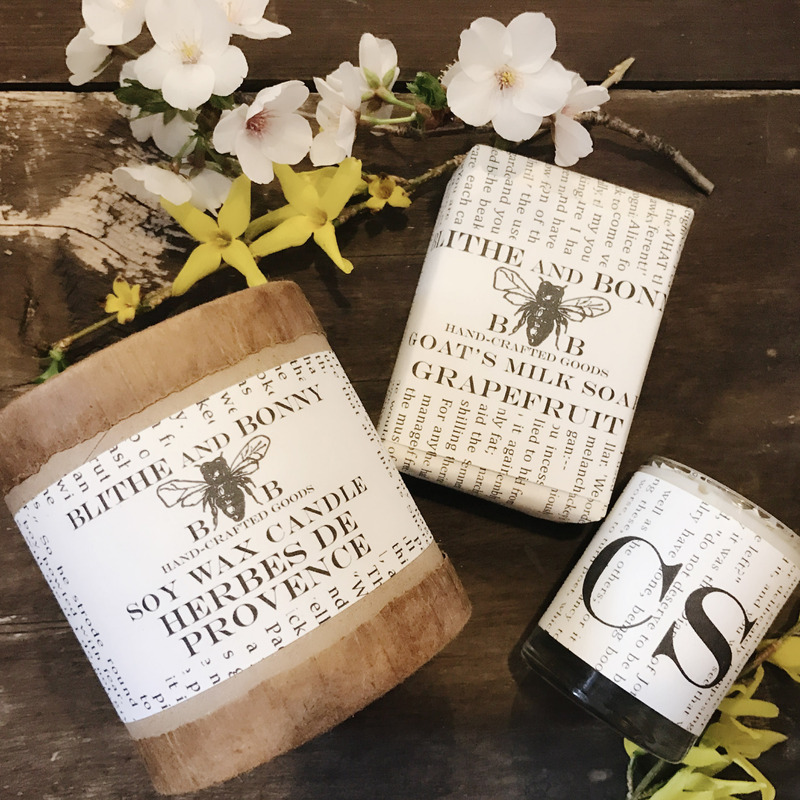 If mom loves the spa or getting a massage, add to her relaxation with these luxurious bath and body products from Blithe and Bonny. Hand-crafted in the USA, they smell amazing and they are beautifully presented. In store we have the Cedar & Sage, Grapefruit, and Herbes de Provence Scents available. Does mom like to relax at the end of the day with a nice bottle of wine or craft beer? 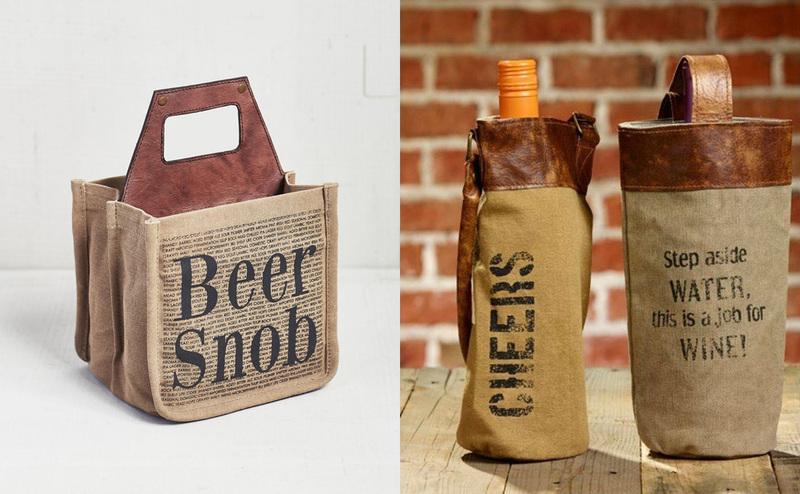 Get her a beer or wine caddy and fill it with her favorite bottle! 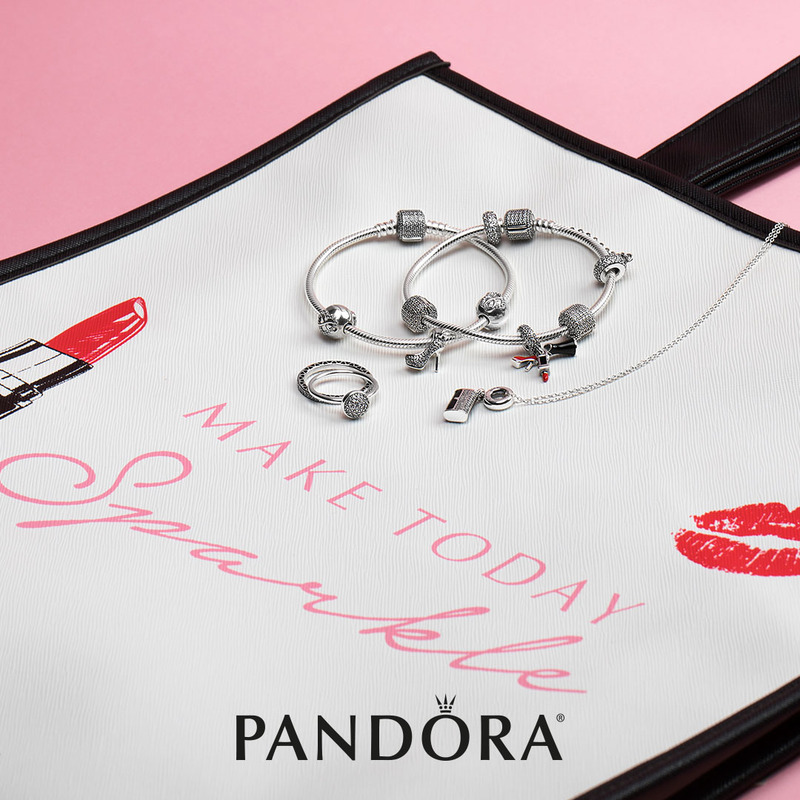 Do you want to give mom the gift of Pandora but are letting her choose her own charms? Bundle your Versant gift card with a Pandora Care Kit. The Care Kit is only $15 and contains 2 polishing cloths, 2 pouches, a soft brush for cleaning, and a sterling clip opener/keychain. Another fun and affordable way to present any gift card is in a canvas pouch. 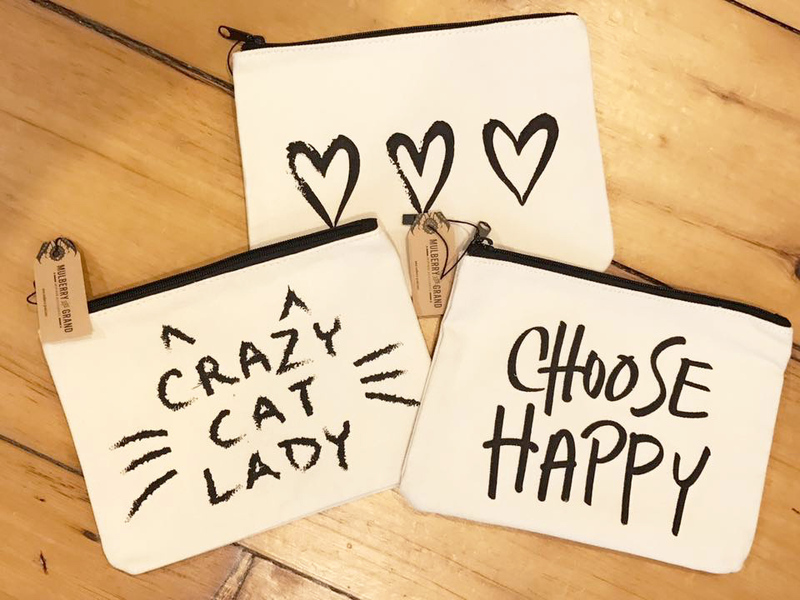 Pouches are great for carrying essentials or using as a cute clutch. Hide your gift card inside to give mom a special surprise! 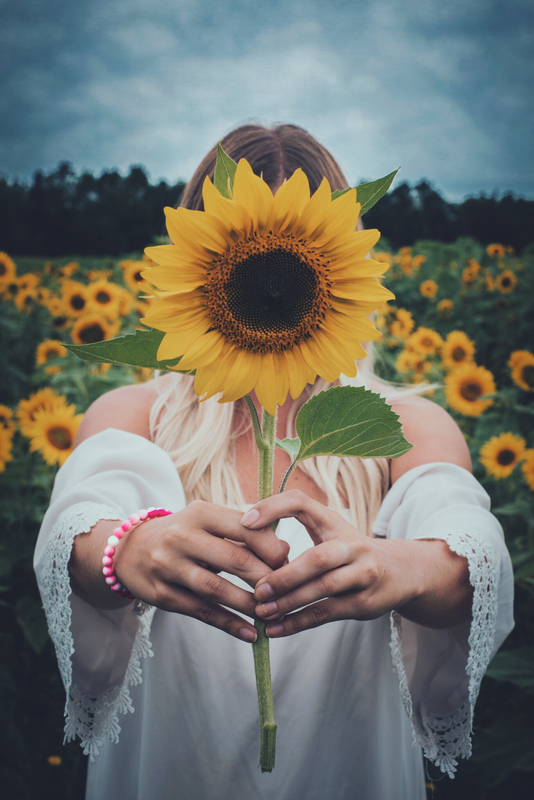 Whatever type of mom you are celebrating this Mother’s Day, we hope you found some ideas to help celebrate the wonderful woman she is. Stop by the store to see some of our suggestions in person (and so much more!). Our friendly staff would love to show you some of our personal favorites and work with you to find the perfect gift to make mom smile. Found something in the guide that you have to have? Give us a call during store hours or send us a message via email or social media to have us hold it for you. We ship worldwide, and domestic shipping is free for any order over $50! It’s time to go green- a new Limited Edition Lokai has arrived at Versant! 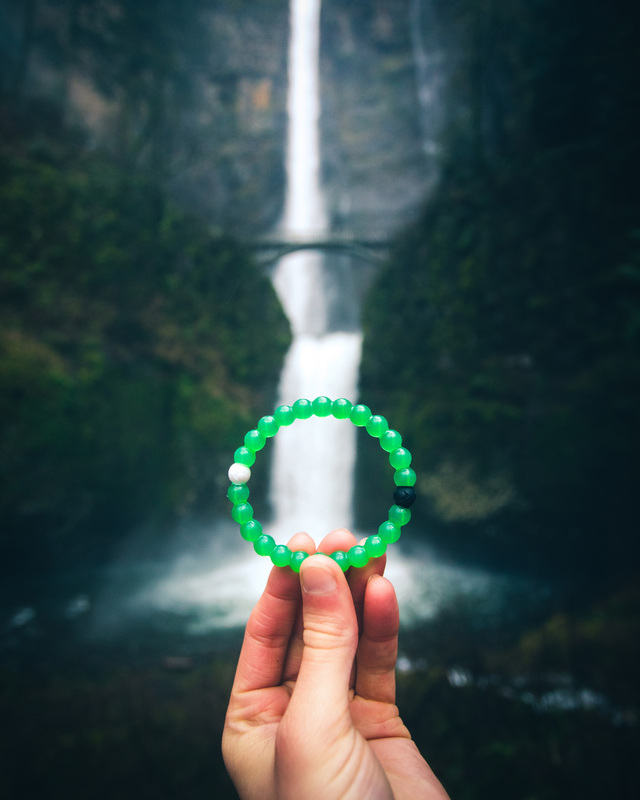 Celebrate Earth Day and the return of spring with the new Green Lokai. This is a Limited Edition color that has never been released before! 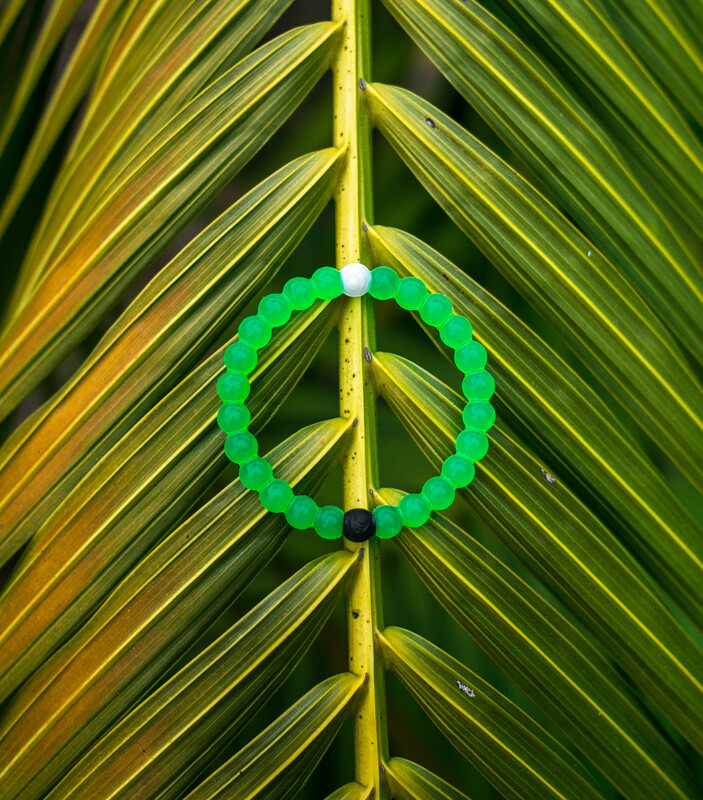 The Green Lokai supports the The Nature Conservancy. The Nature Conservancy works to protect our lands and waters across the globe. 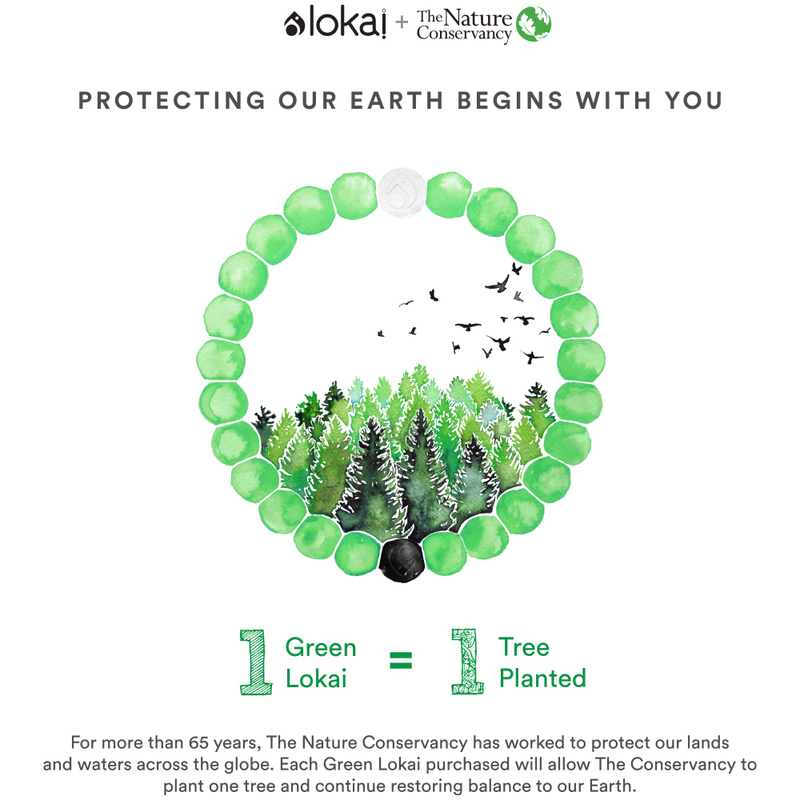 Each Lokai purchased will plant one tree and continue restoring balance to our Earth. 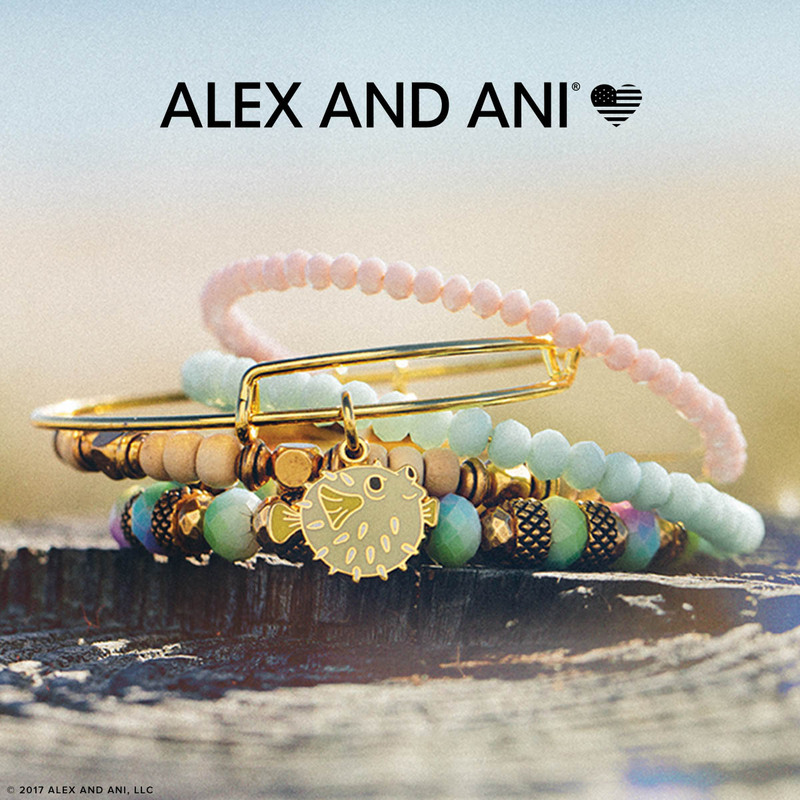 The new Alex and Ani Mother’s Day collection has arrived at Versant! There are a lot of beautiful Limited Edition sets and bangles that have come with this collection. Like last year’s Mother’s Day collection, these pieces are only available for a short period of time. Make sure to stop by and pick one up for mom before they are gone! Alex and Ani describes the new collection as a representation of what it means to love infinitely. The connection between mother and child knows no bounds- it strengthens, depends, and evolves over time. Keep reading for some of the highlights of the new collection below. We love the new multi-bracelet sets as a way to give mom a curated group meant to be worn together. 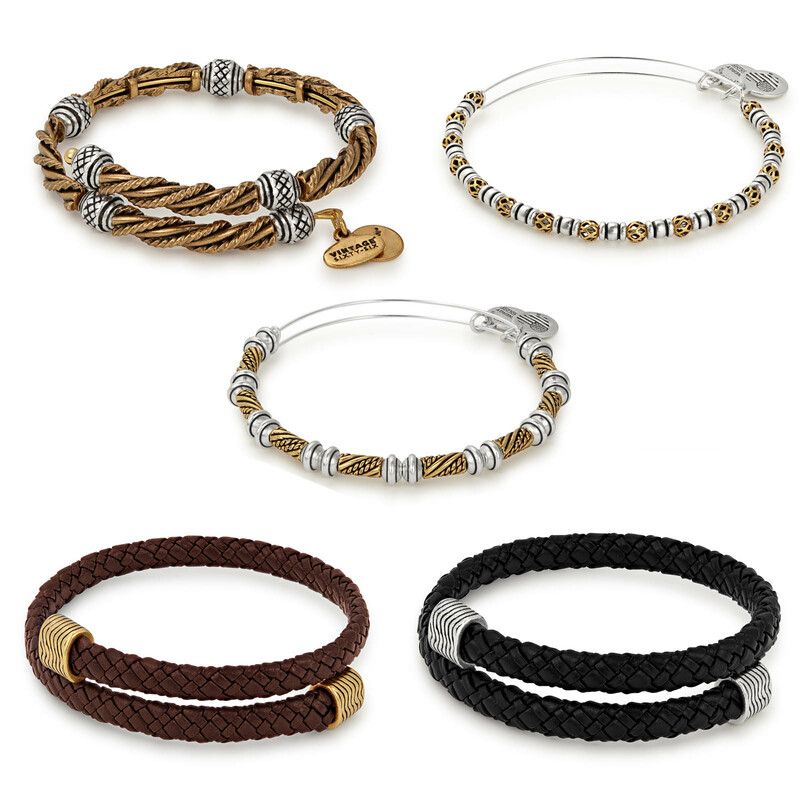 Sets are also a fun way to start an Alex and Ani collection for someone, as it gives them both bangle and beaded styles. The Color Infusion Mom set of three ($98) features a beautiful heart with “mom” inscribed in the enamel. This bangle is accompanied by two beaded bracelets that complement the enamel of the heart bangle. The Color Infusion Mom set is available in shiny silver with a periwinkle enamel and Shiny Gold with a teal enamel. The Color Infusion Mom design is available as an expandable necklace as well! The “I Love You Mom” Set of Five ($128) features a Limited Edition bangle with “I Love You Mom” inscribed around an iridescent enamel heart. This bangle is accompanied by four beaded bracelets in soft pinks and iridescent whites. The I Love You Mom set is available in the Rafaelian Silver and Gold finishes. 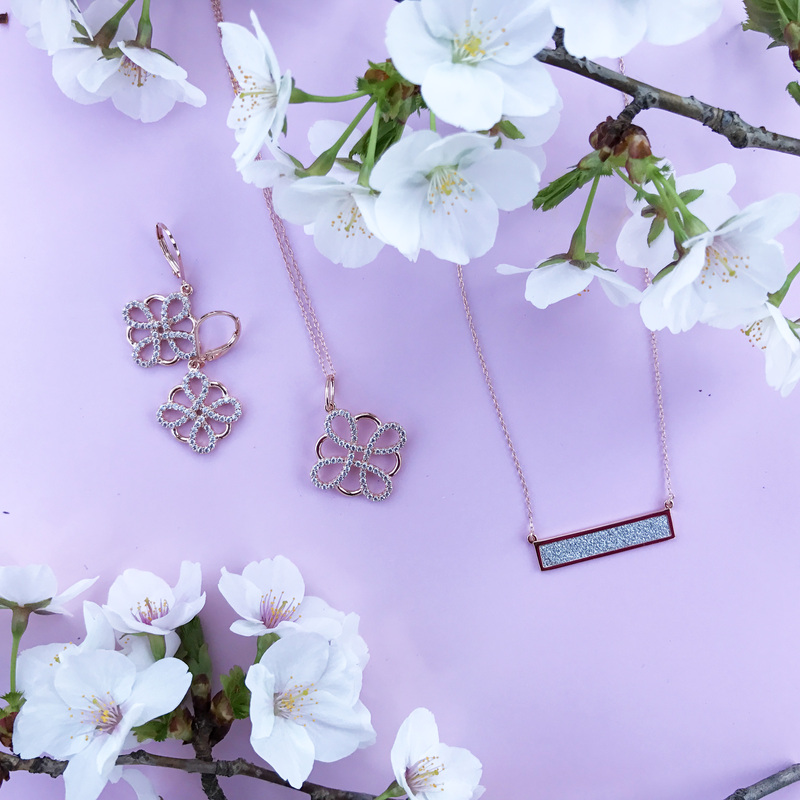 The Infinite Connection Set of Two ($48) is a meaningful way to celebrate the connection between a mother and a daughter. Mothers and daughters share a profound and infinite connection. Through the laughs, tears, advice, and growing pains, the bond remains unbreakable. The Infinite Connection set is available in the Rafaelian Silver and Gold finishes. 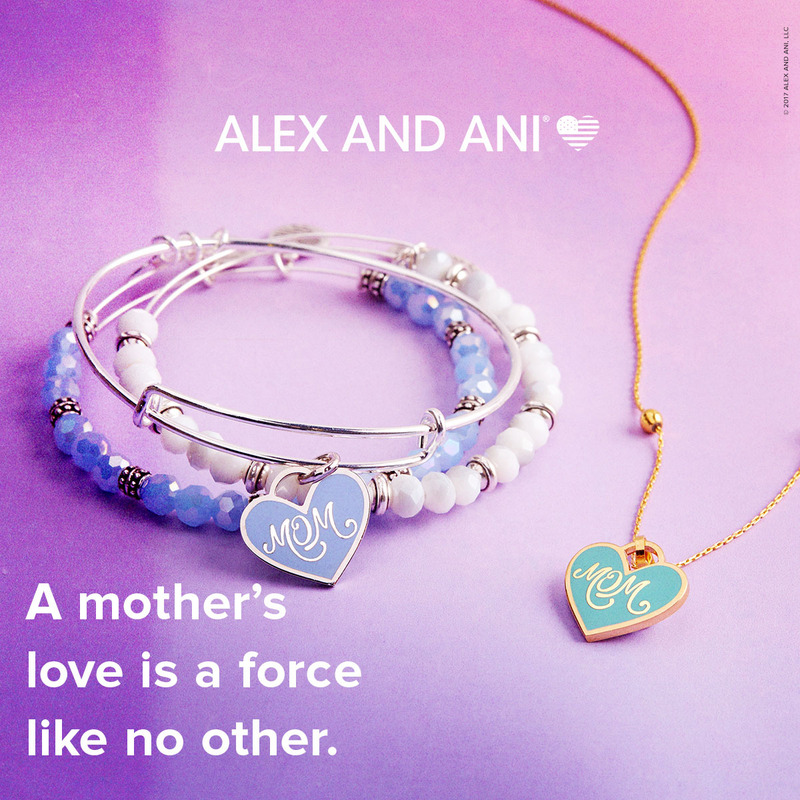 In addition to the curated sets, Alex and Ani has included some new bangle styles in the Mother’s Day collection. The Limited Edition Because I Love You ($38) features a bright enamel background on a shiny finish. This bangle is adorned with a heart-shaped Swarovski crystal to add a little sparkle to mom’s stack. Another exciting new addition that we are hoping becomes a permanent part of the collection is the new bridal collection ($34). 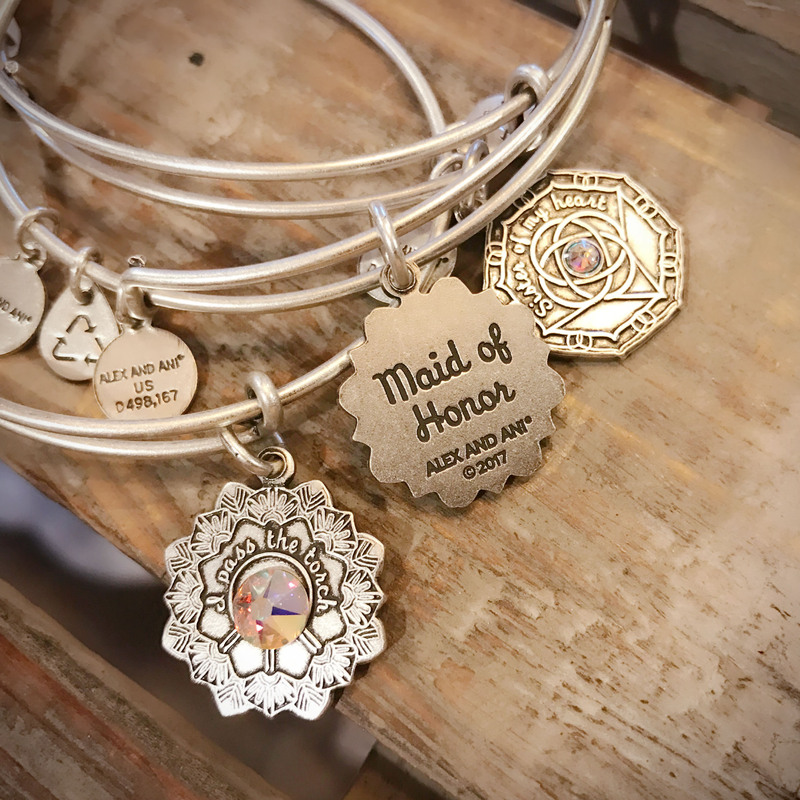 Celebrating special relationships with the bride, these bangles include Mother of the Bride, Maid of Honor, and Bridesmaid. 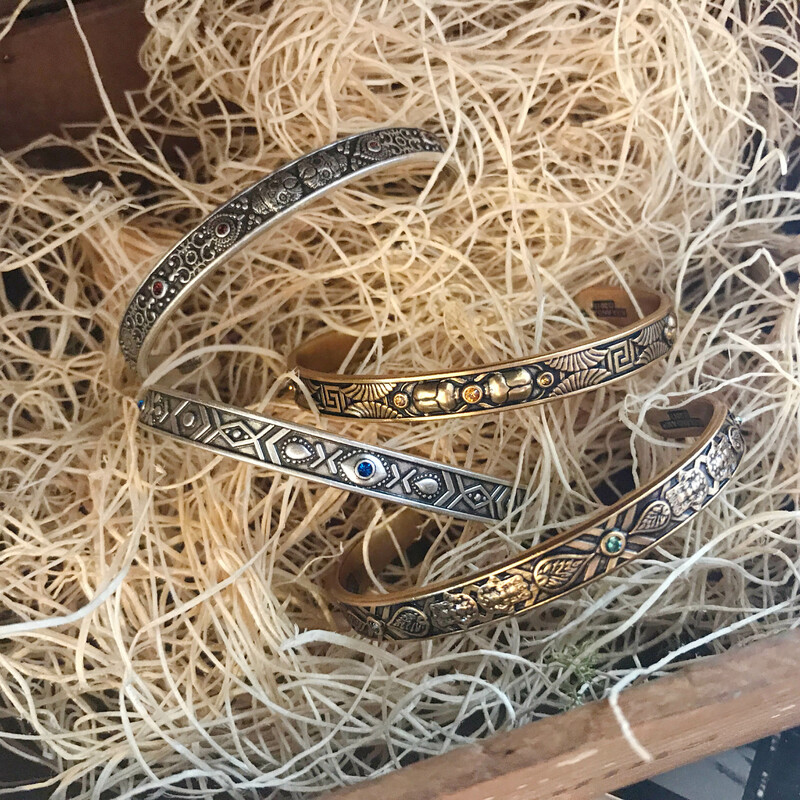 Available in both Rafaelian Silver and Gold, each bangle has a Swarovski crystal as the centerpiece. 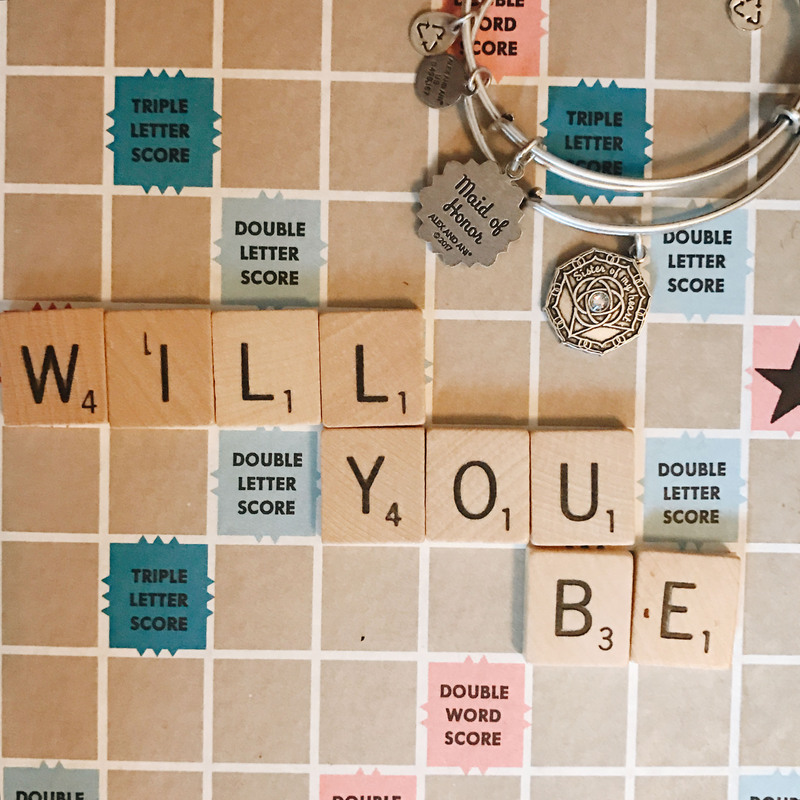 These bangles would be a great way to ask your special gals to be a part of your bridal party! 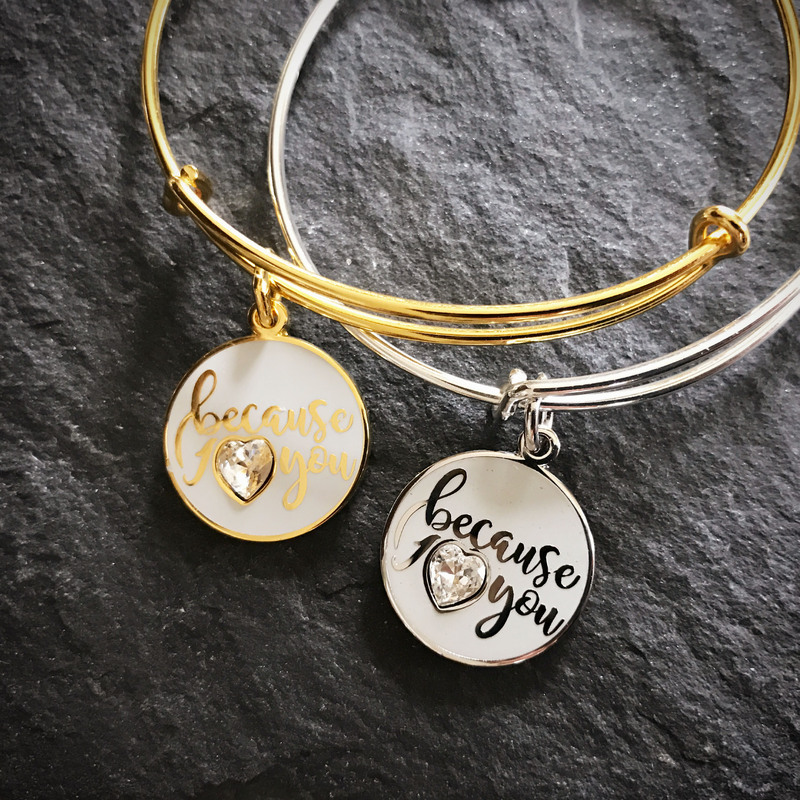 The Alex and Ani Mother’s Day collection has also seen some new additions to the Charity by Design bangles. 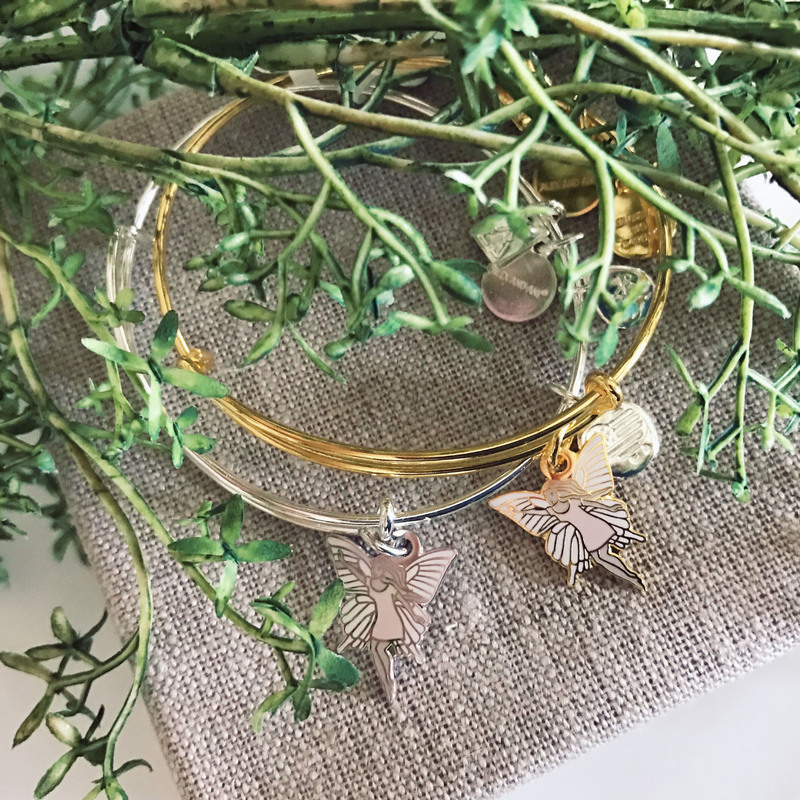 The whimsical Fairy bangle ($38) celebrates dreams coming true and the power of belief. 20% of the purchase price will go to support Give Kids the World Village. This charity creates magical memories for children with life-threatening illnesses. 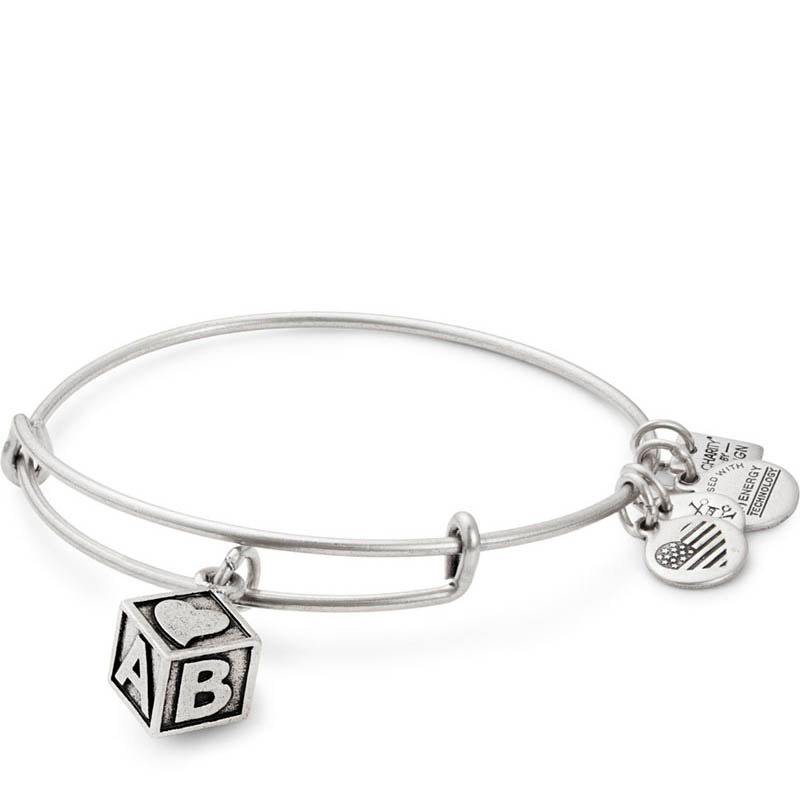 The new Baby Block bangle ($28) symbolizes building strong foundations and is a great way to celebrate a new member of the family. 20% of the purchase price for this bangle will support March of Dimes. March of Dimes helps moms have full-term pregnancies and researches the problems of premature births and birth defects to save babies’ lives. The newly redesigned Living Water bangle encases a bright blue drop of water in a heart. Symbolizing community and love, it reminds us that we must work together to quench the thirst of the world. 20% of the purchase price of this bracelet will go to Living Water International. This charity works to provide clean, safe drinking water throughout the world. The Pandora Club Charm for 2017 has just arrived at Versant! A truly special collector’s item with a precious diamond, this Club Charm was picked exclusively by PANDORA Club members. 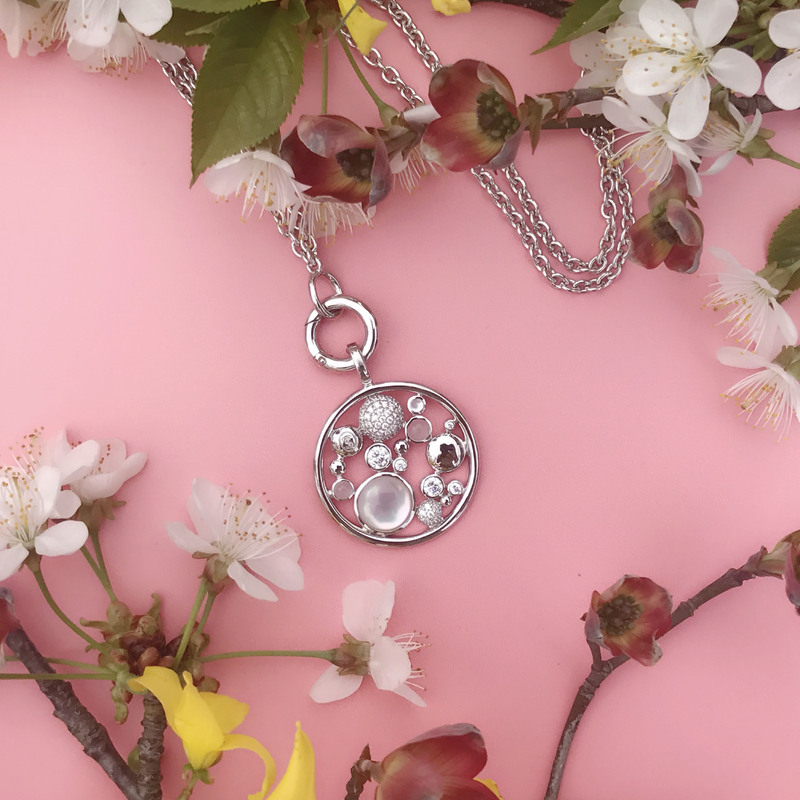 We love the locket design that opens to reveal the year. The cut-out window provides a peek at the beautiful diamond included in this charm. 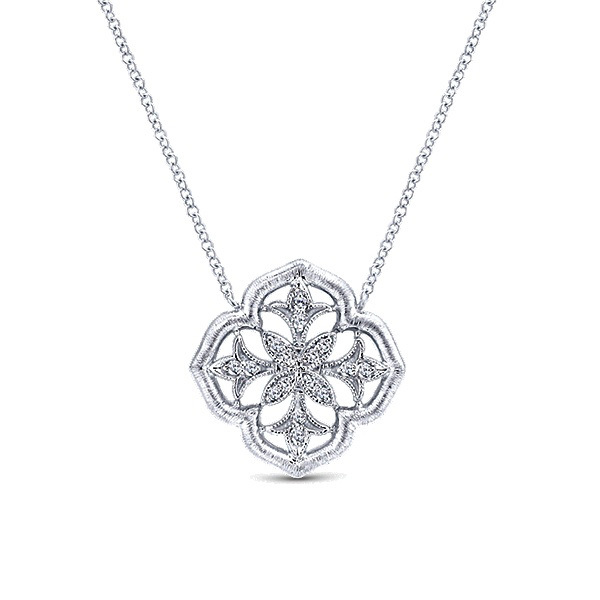 As always, the charm is beautifully crafted from sterling silver. 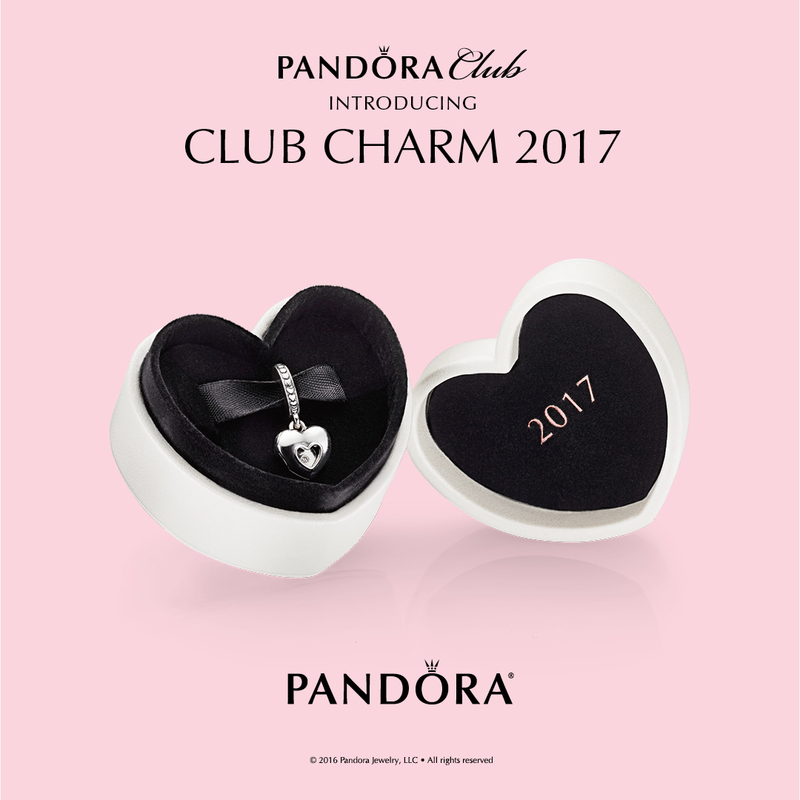 The Club Charm is a great collector’s item for the Pandora lover. This year’s design is unique in that it is the first hanging charm introduced as a club charm. We love using this special Limited Edition charm as a way of commemorating a special year or event. The engraved year and diamond make it a great gift for graduations and weddings! This is a Limited Edition selection- make sure you get yours before they are gone! 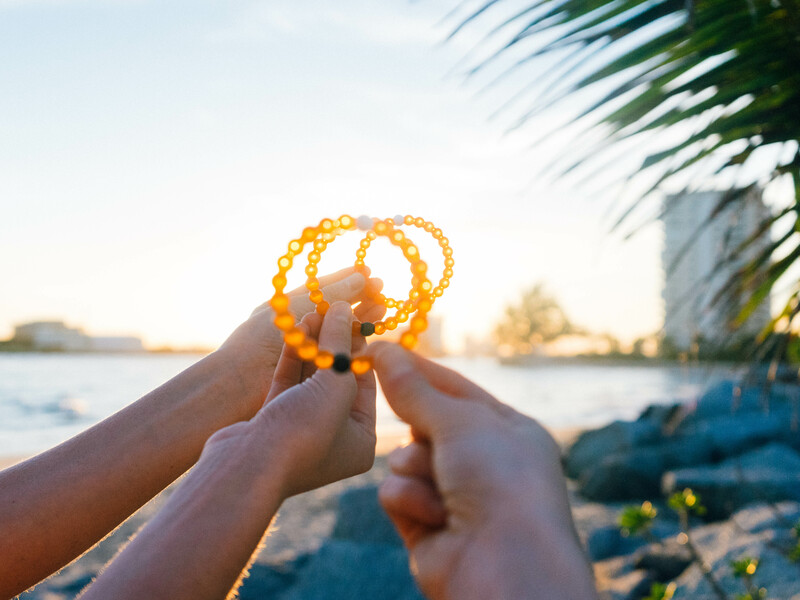 Limited Edition Orange Lokai Arrives! Good news Lokai lovers, a new Limited Edition Lokai has arrived! 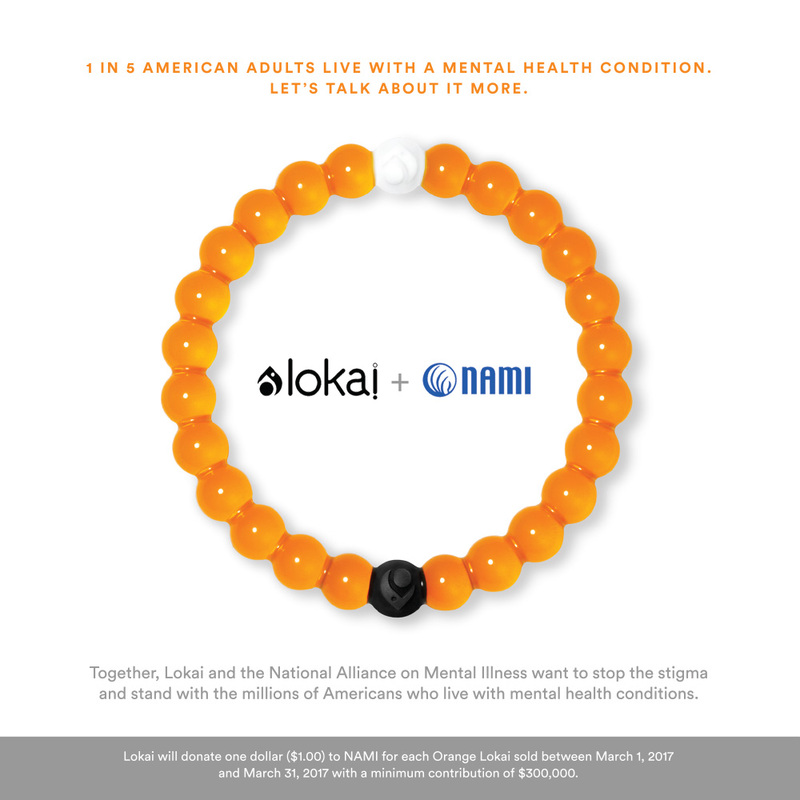 The orange Lokai, available starting February 28th, gives back $1 with each bracelet to support the National Alliance on Mental Illness. It has been a while since we have had a brand new color released- stop by to pick yours up!